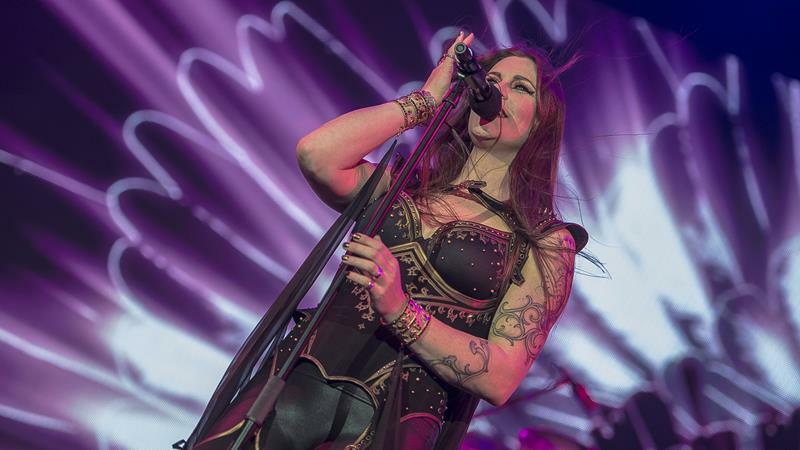 Symphonic Metal giants NIGHTWISH from Kitee, Finland are returning to Europe again, celebrating two full decades of the band’s existence. 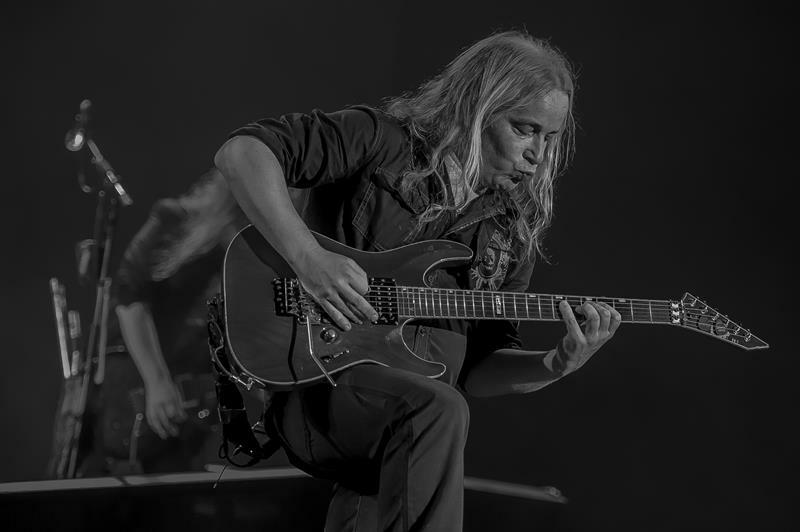 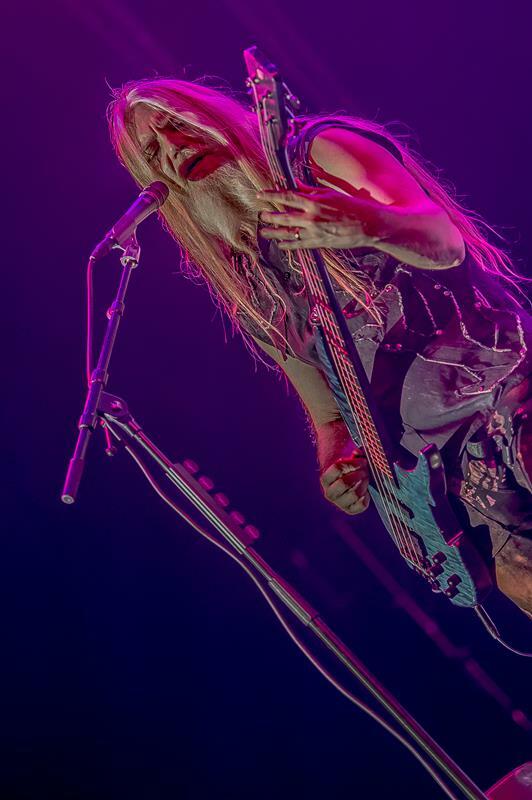 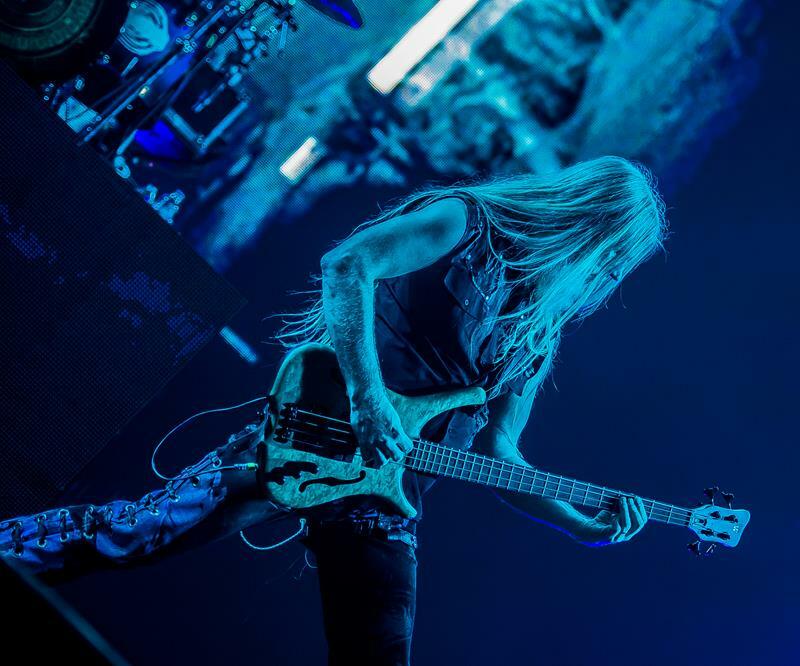 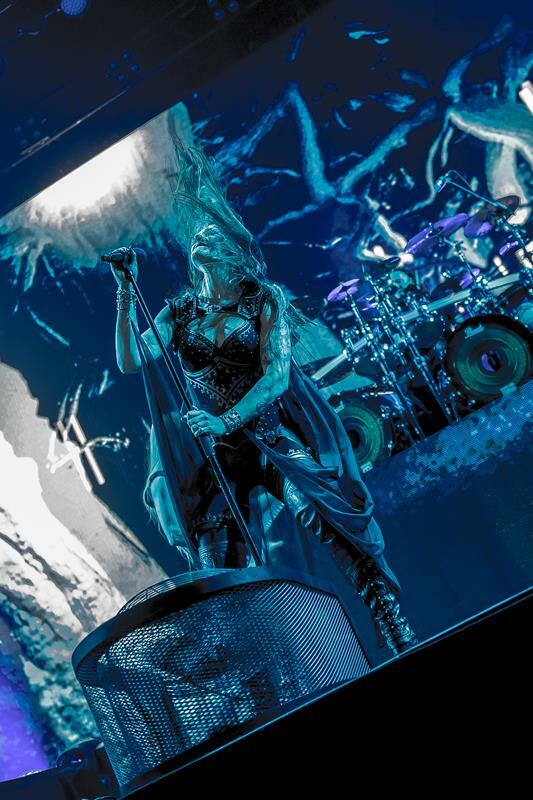 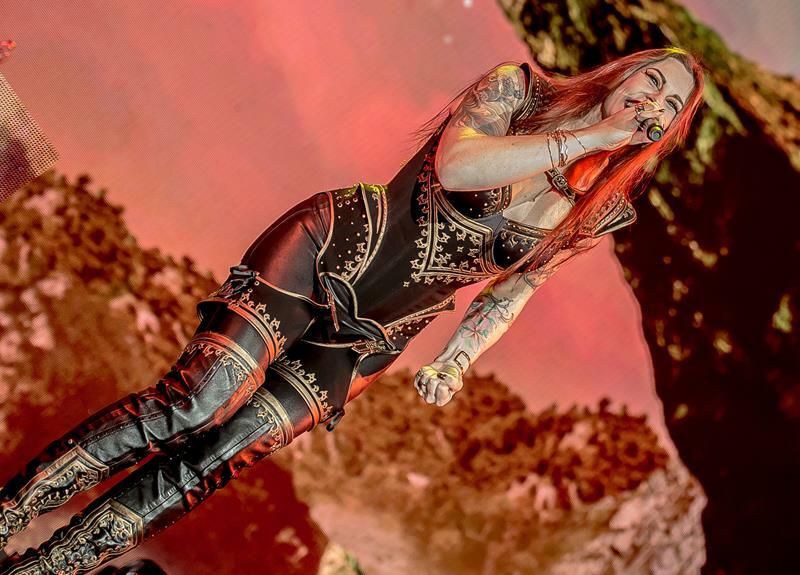 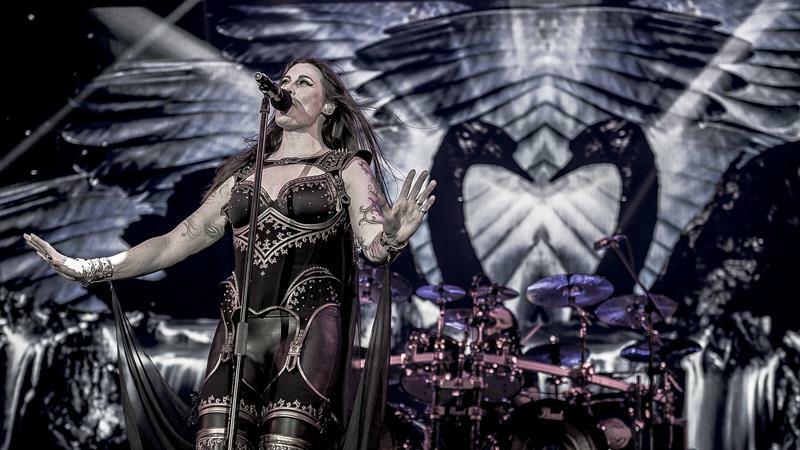 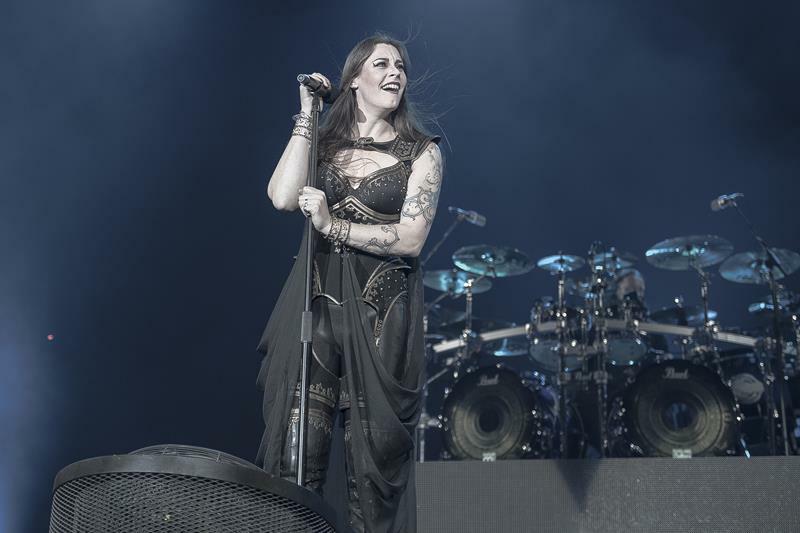 With over 2,000 concerts played and 9 million records sold worldwide, NIGHTWISH are certainly one of the biggest female-fronted Metal bands this world has to offer. 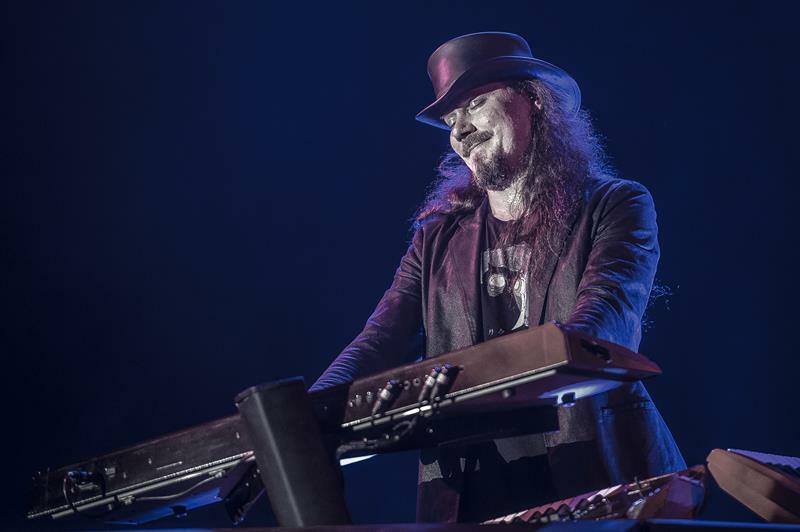 To celebrate the occasion, the band has announced it will play a very special set list, featuring also early, “rarely heard” works of the band. 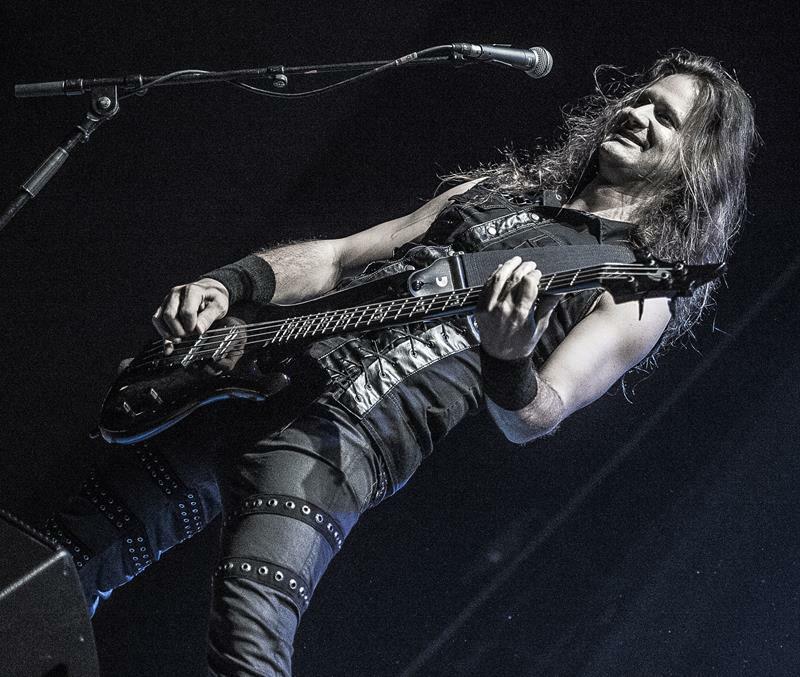 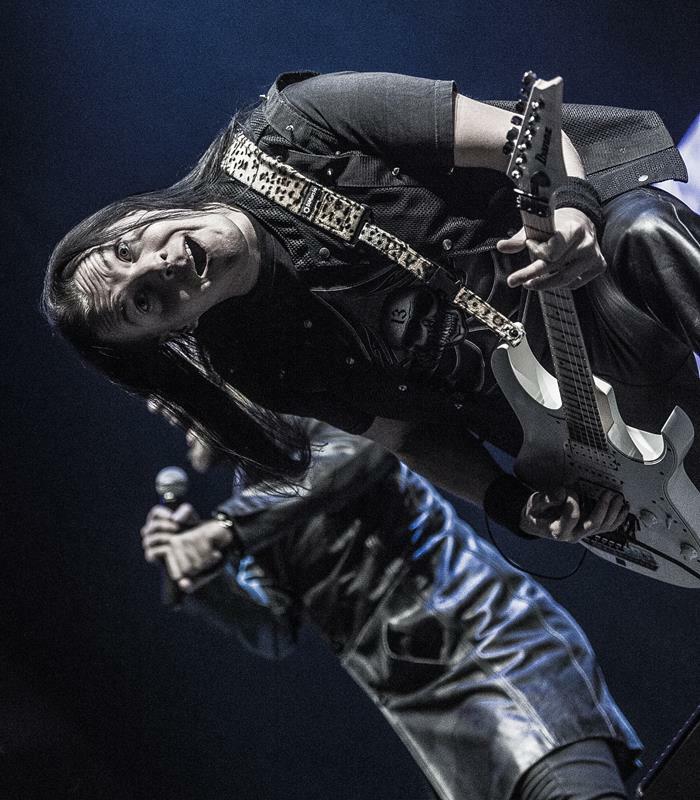 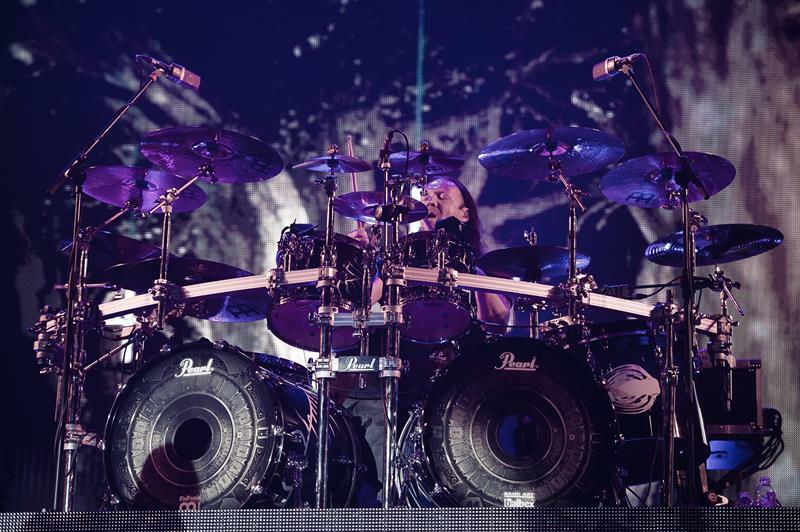 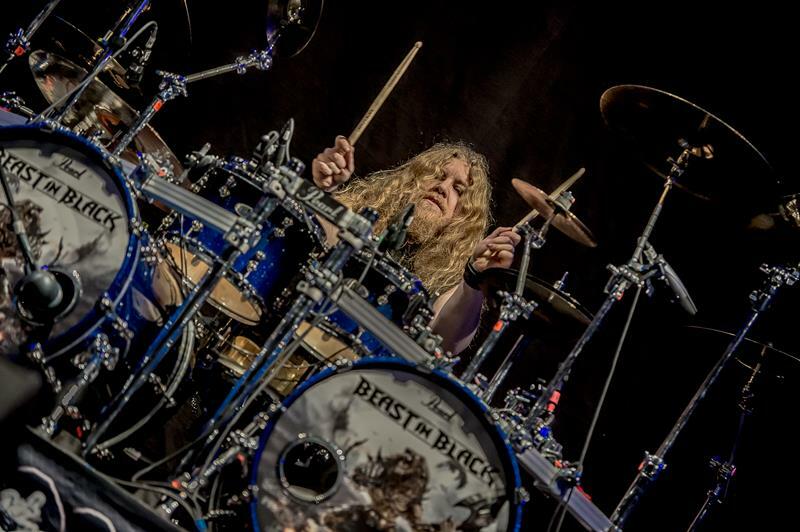 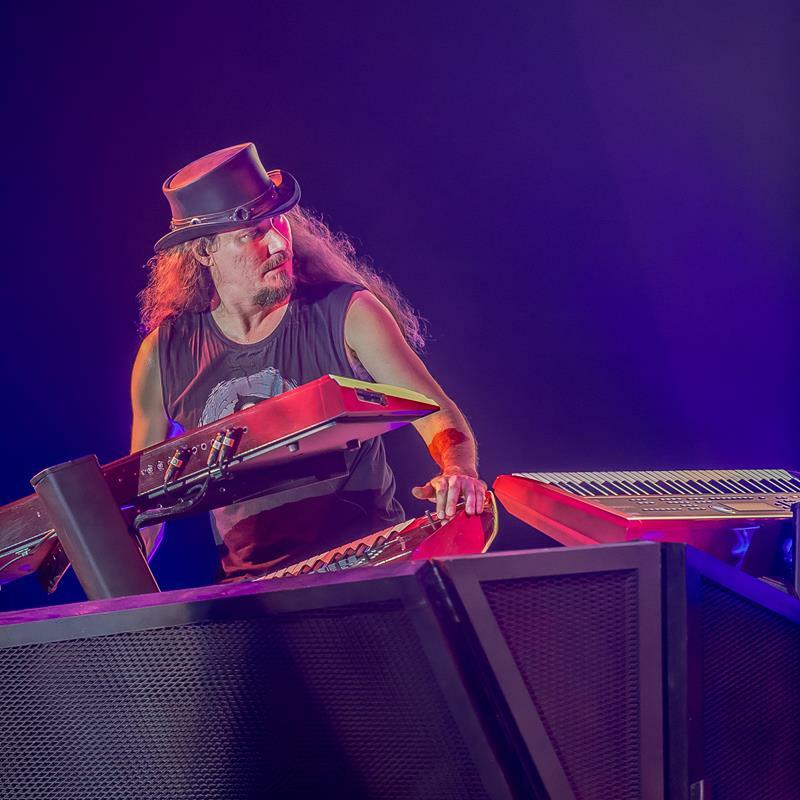 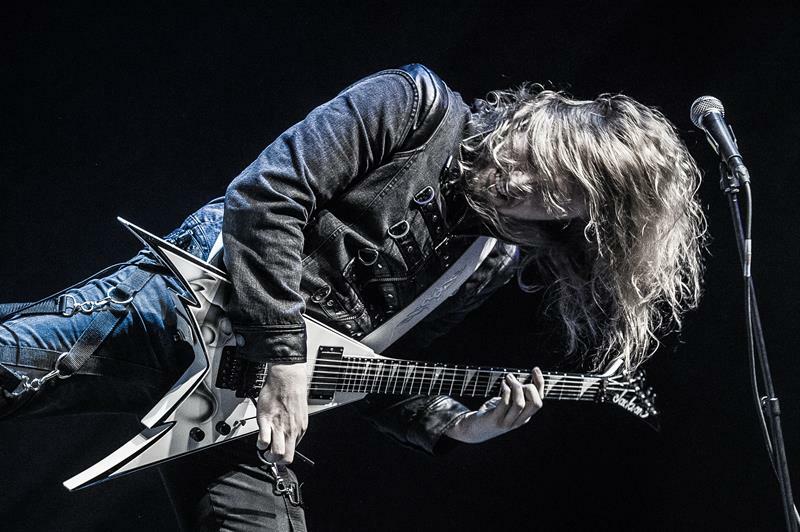 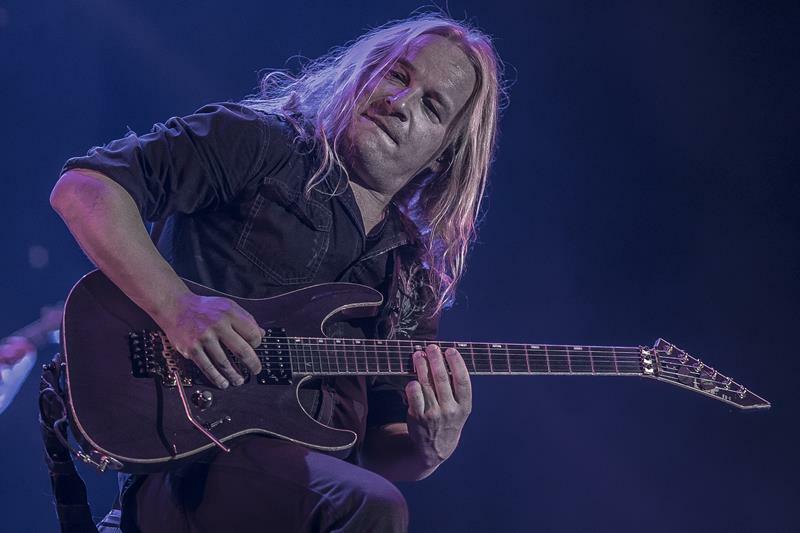 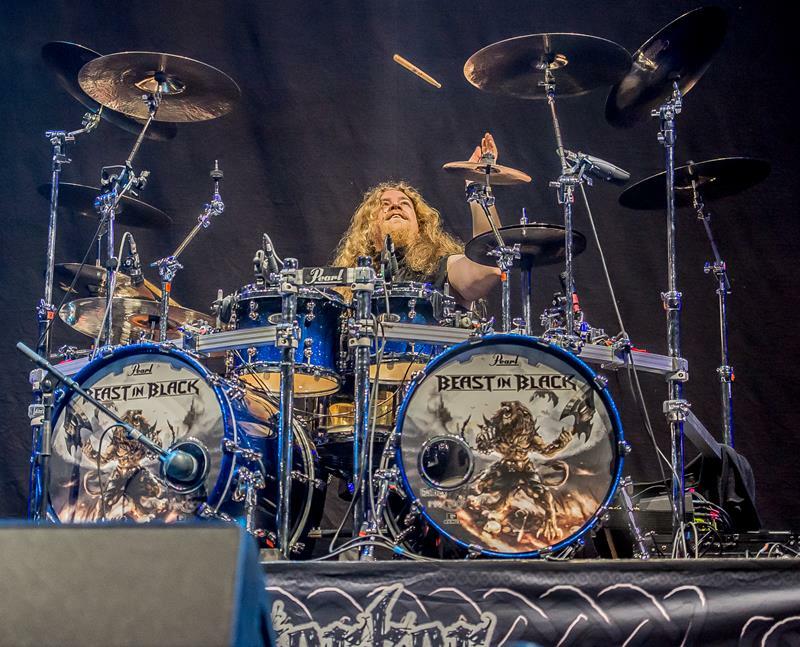 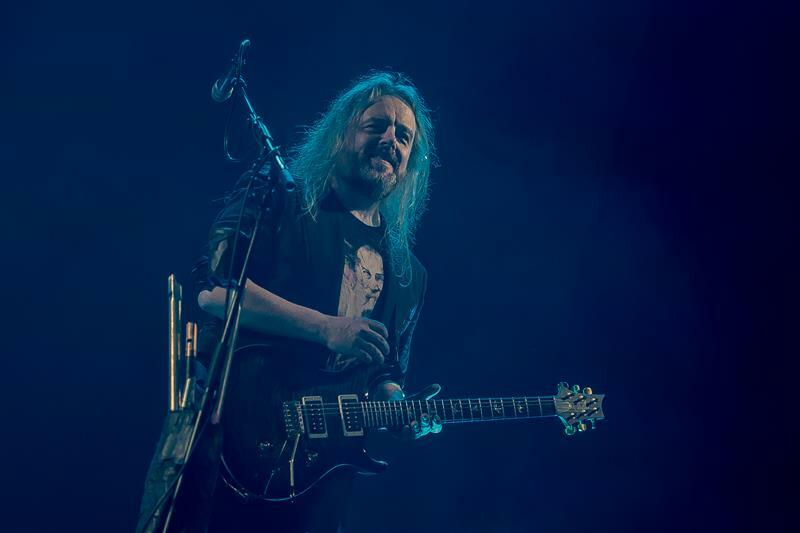 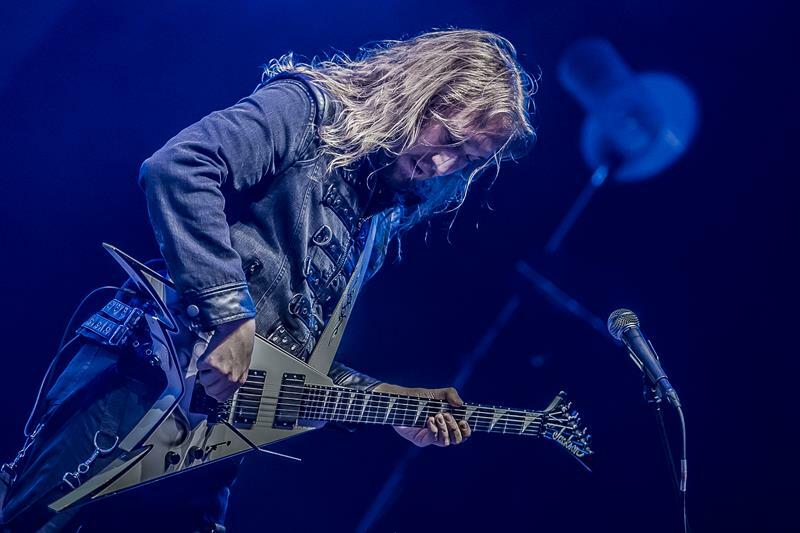 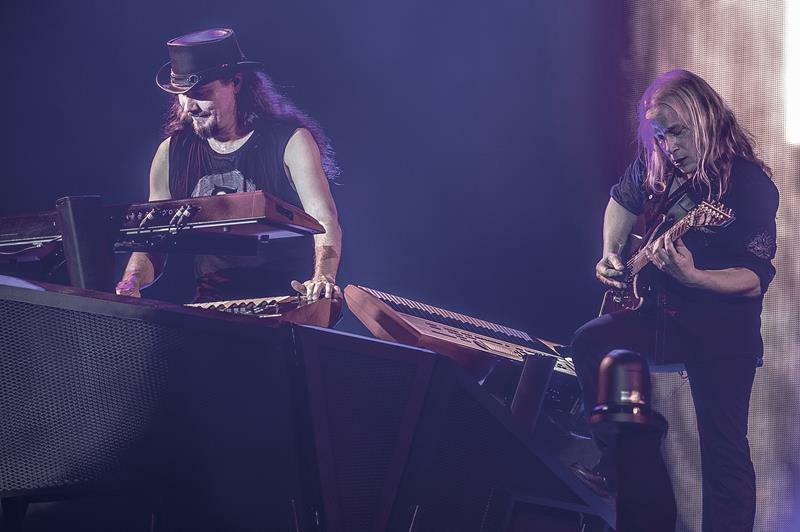 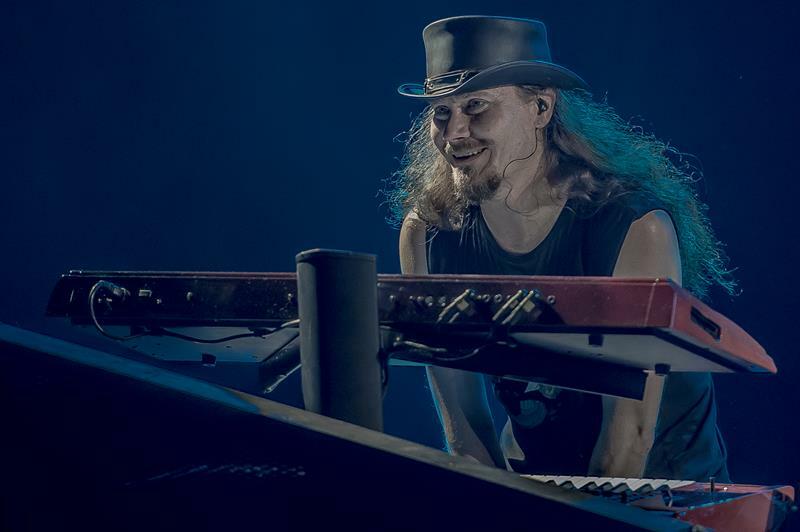 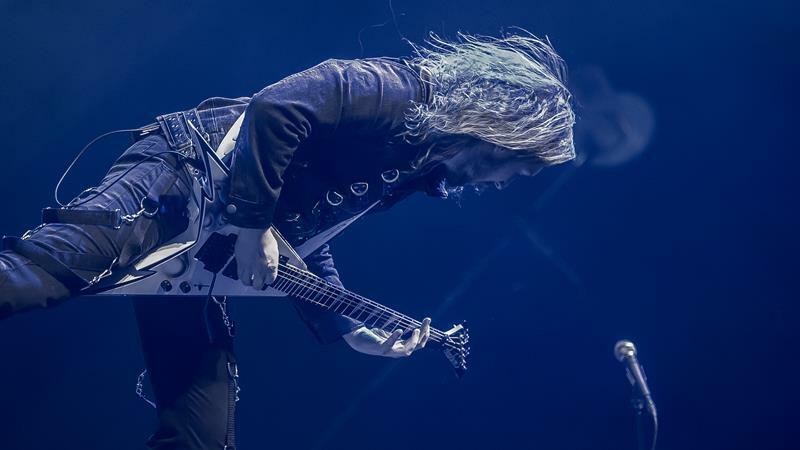 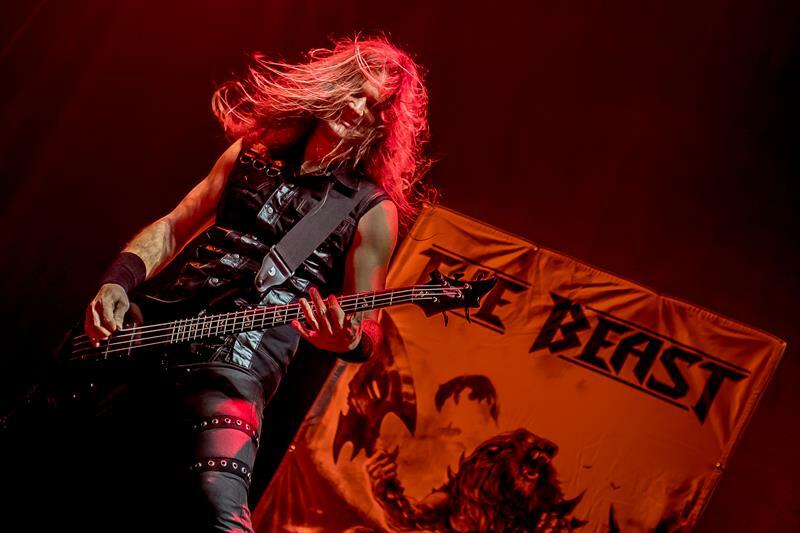 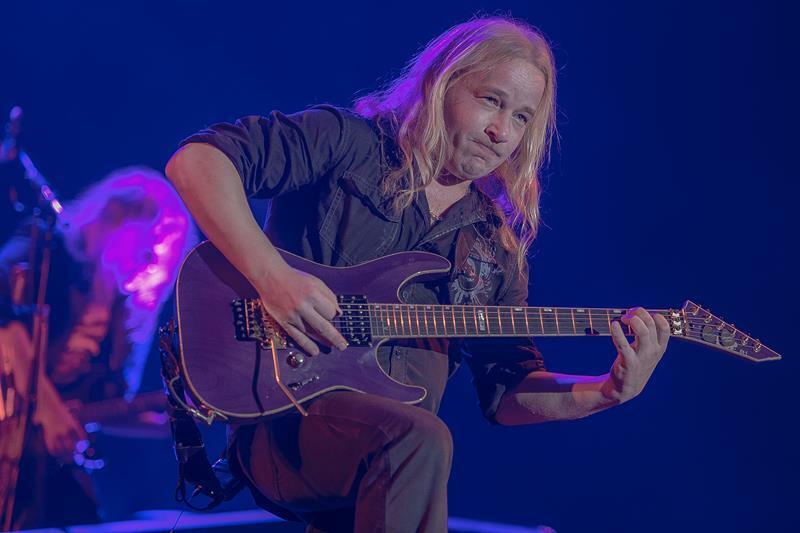 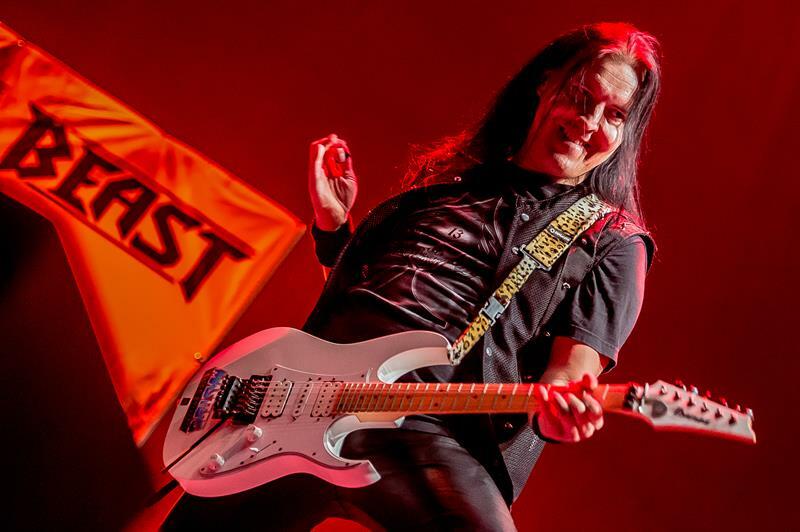 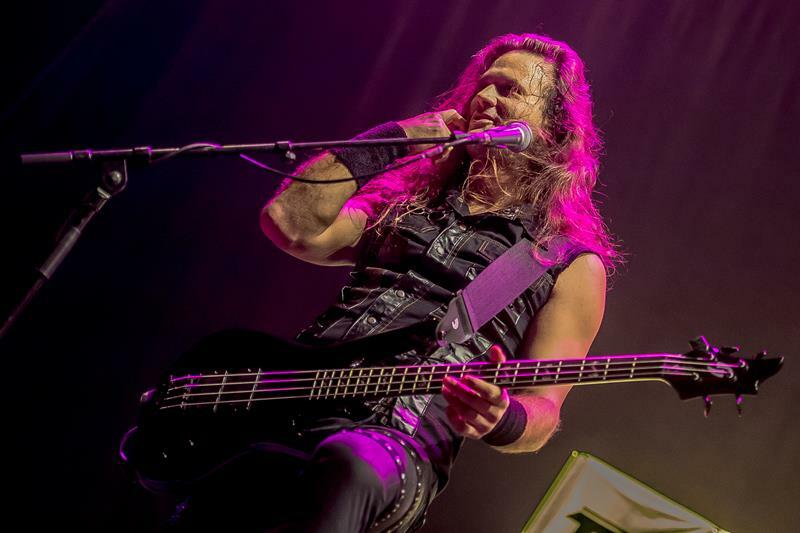 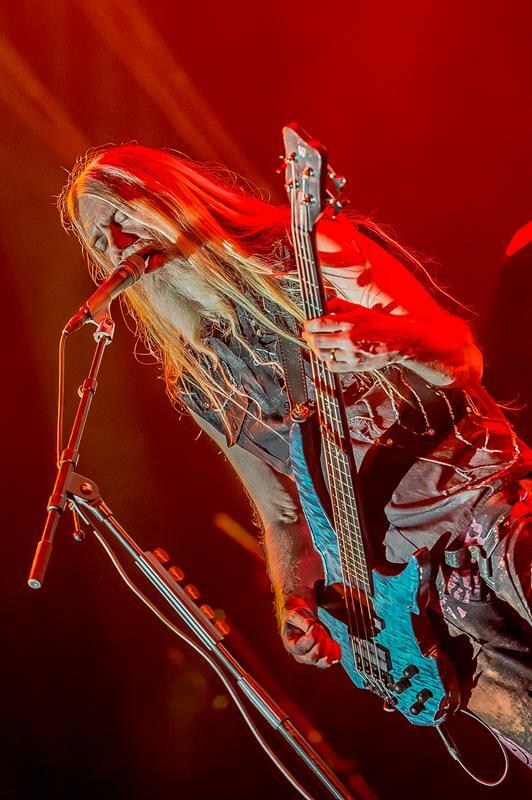 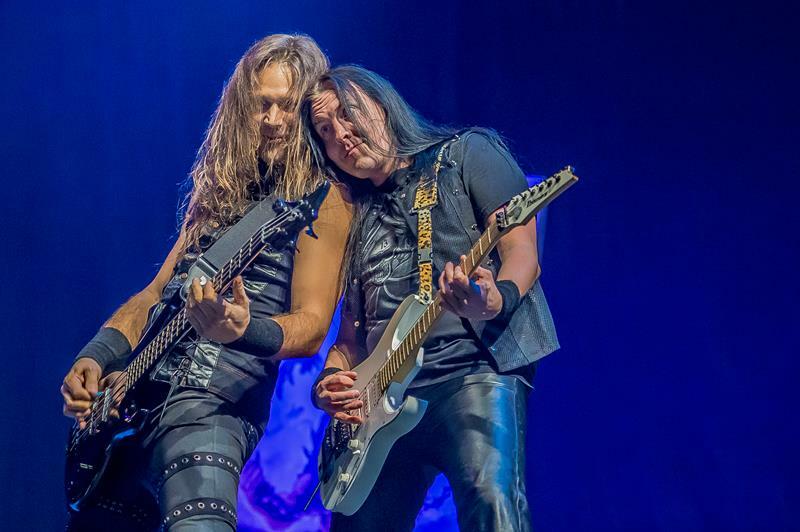 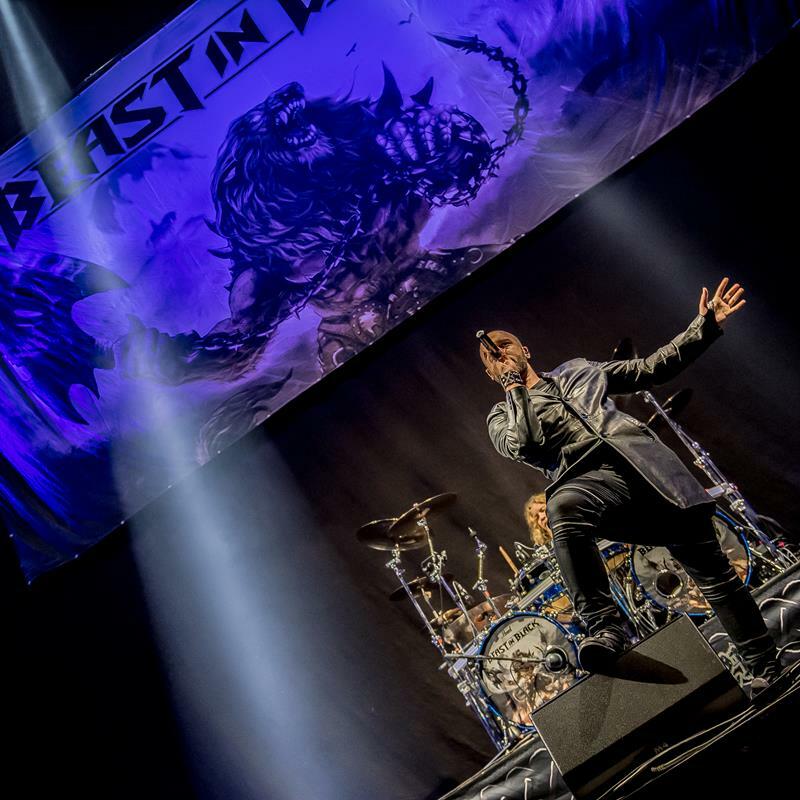 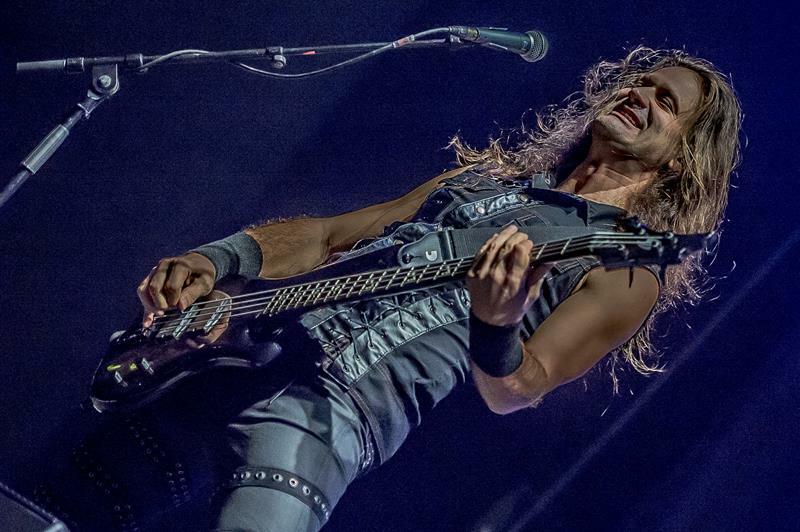 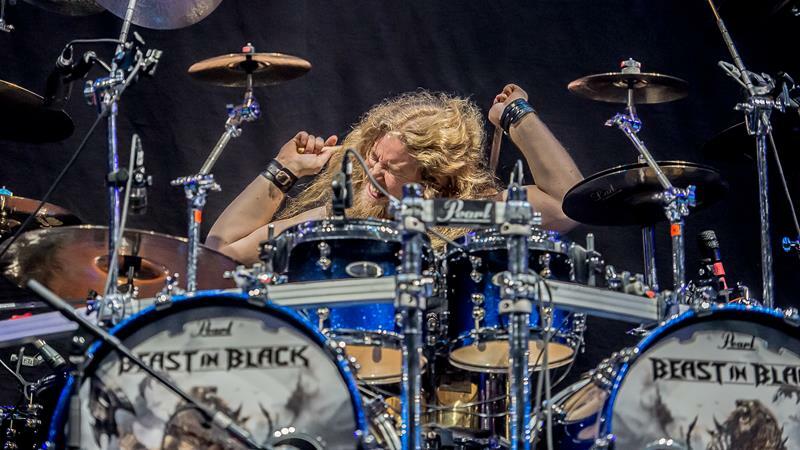 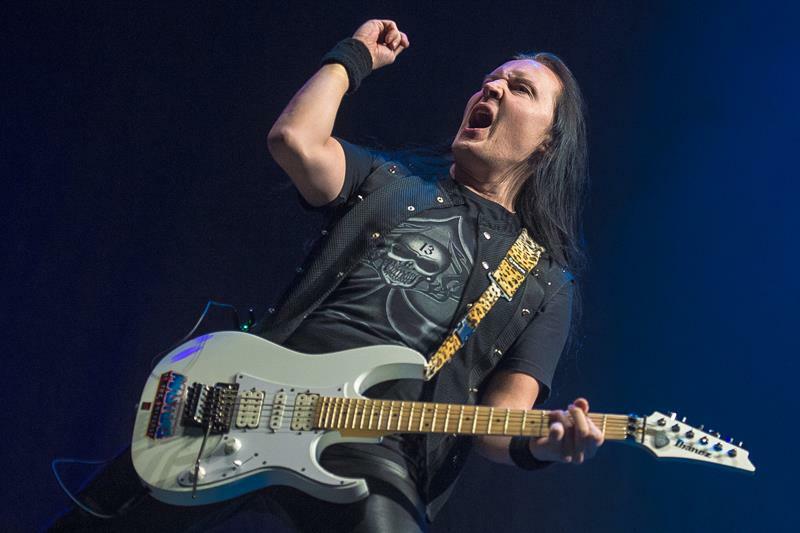 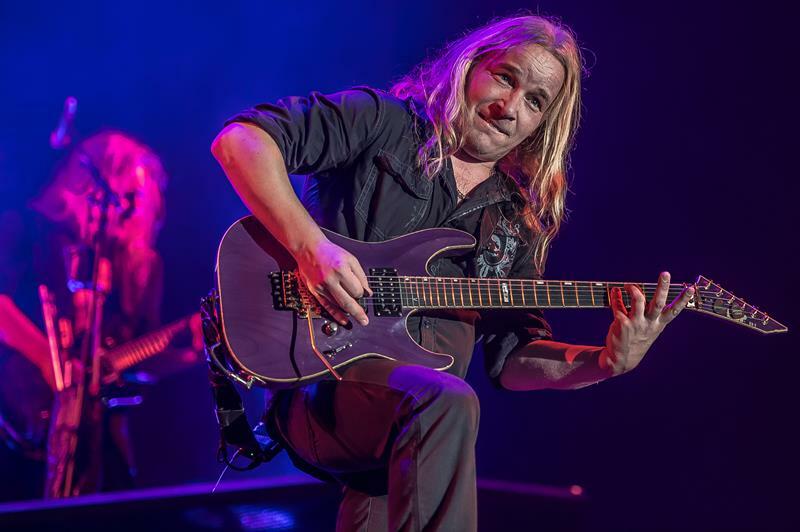 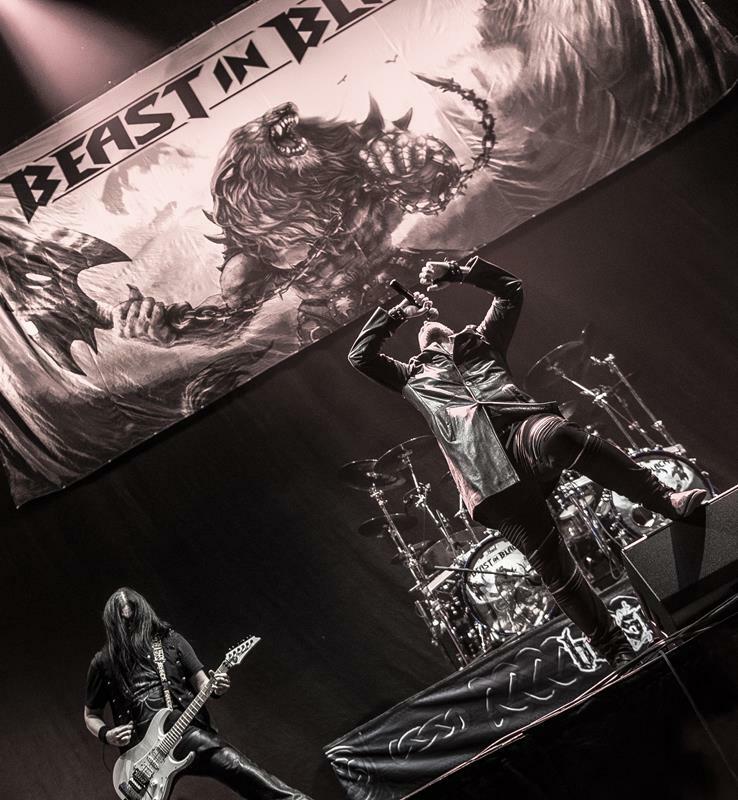 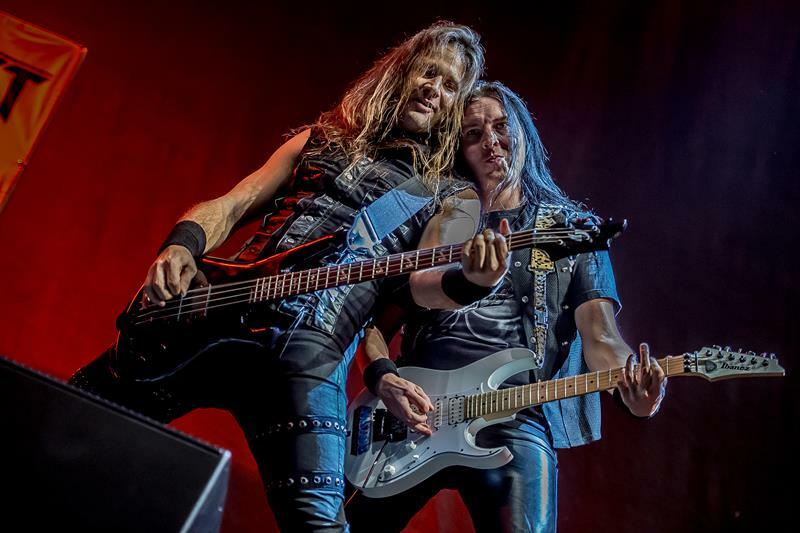 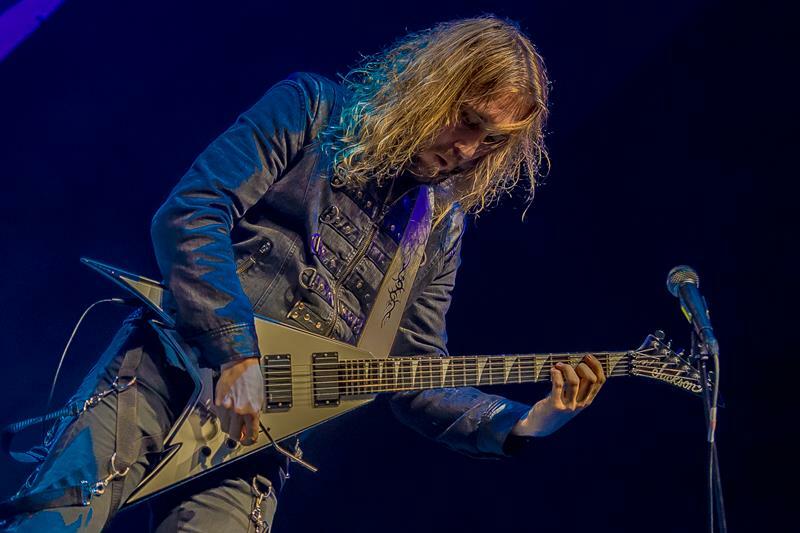 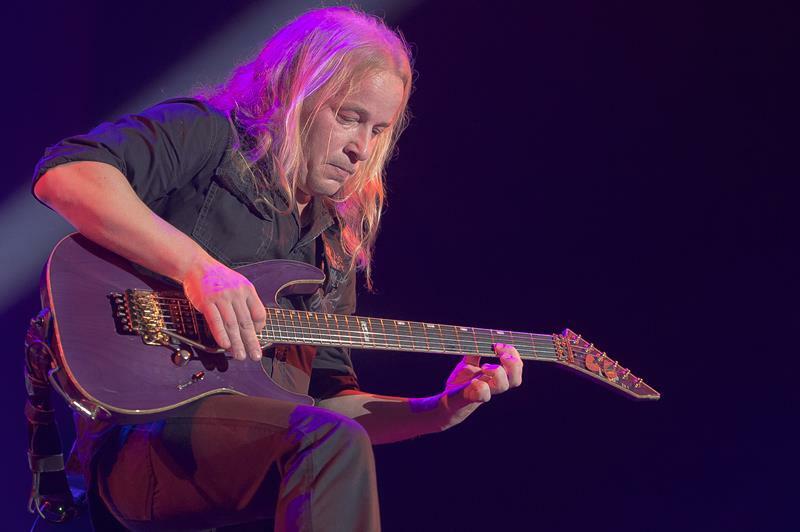 As reinforcements, NIGHTWISH brought their Finnish country mates BEAST IN BLACK with them on tour. 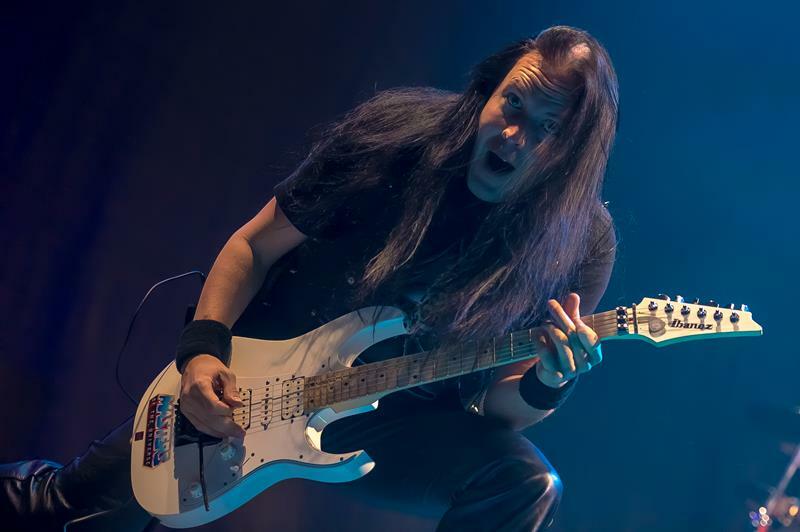 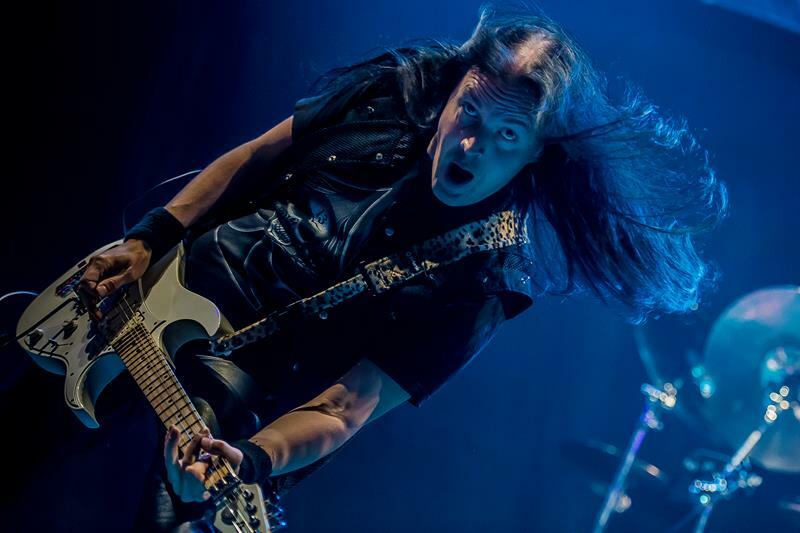 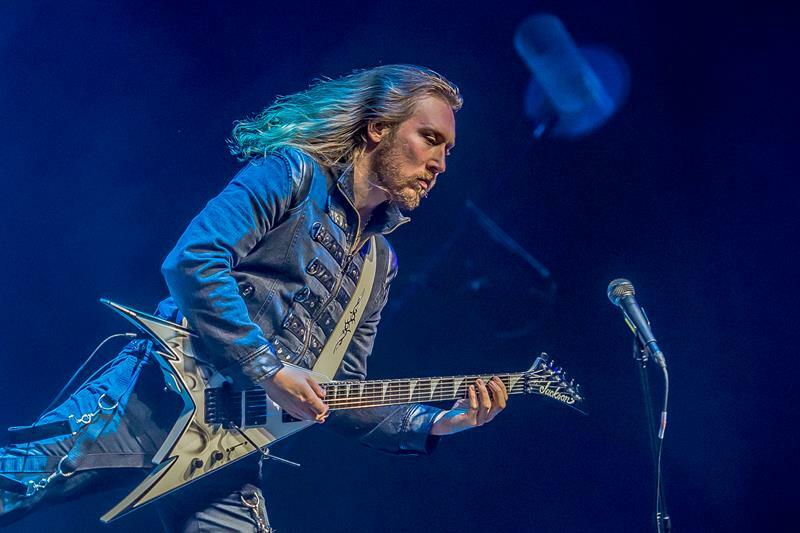 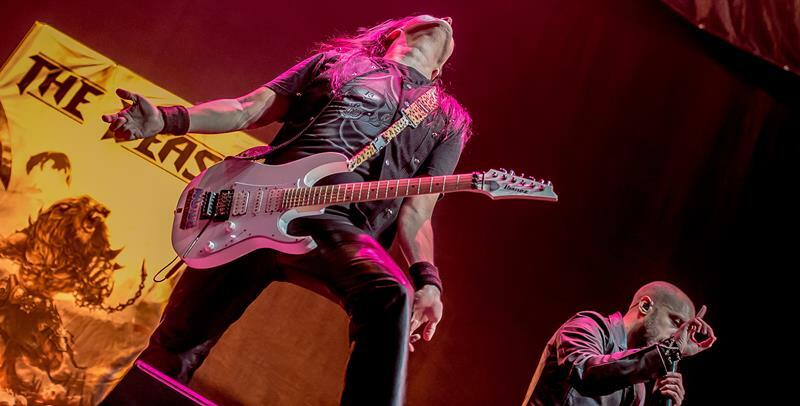 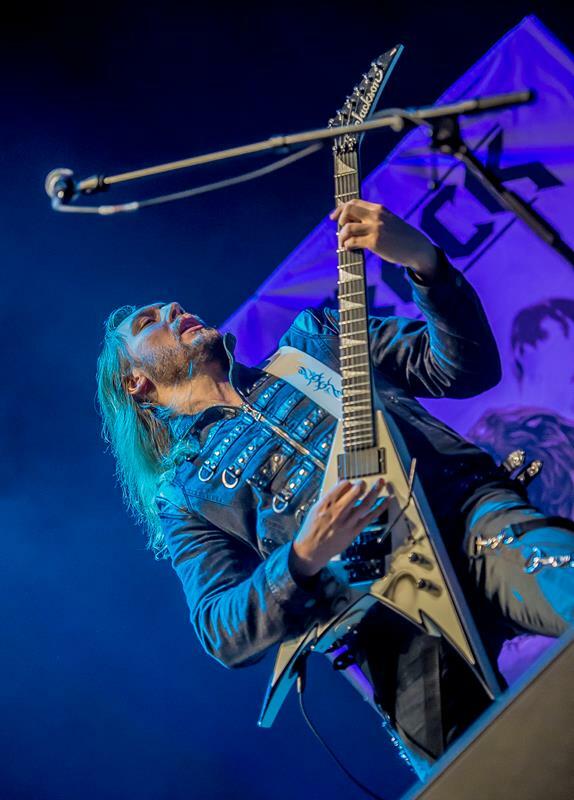 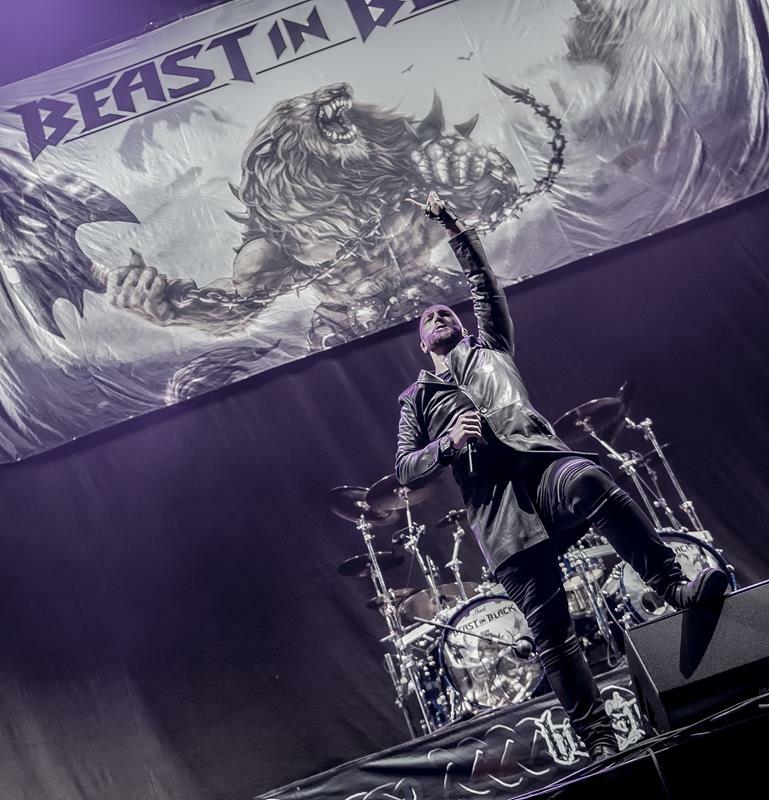 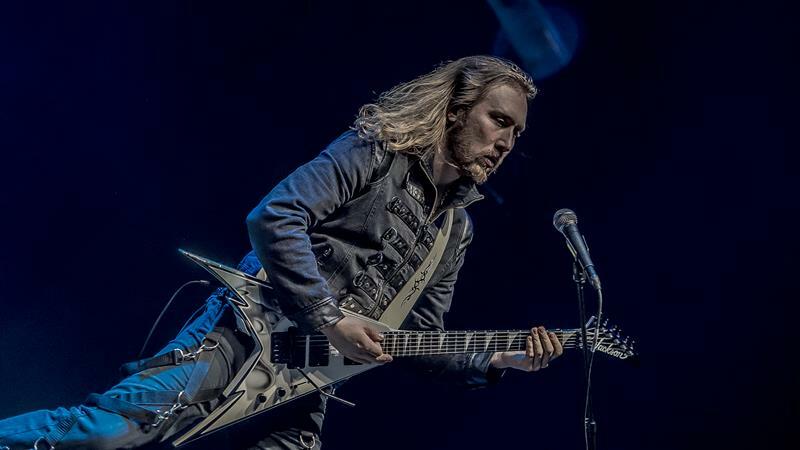 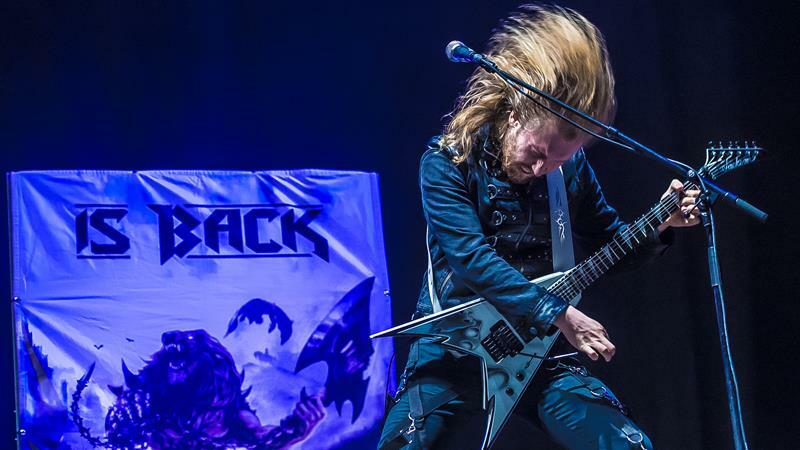 Founded back in 2015 by guitarist Anton Kabanen, the band released their debut album, ‘Berzerk’, in fall 2017 to the critical acclaim of Power Metal fans around the world. 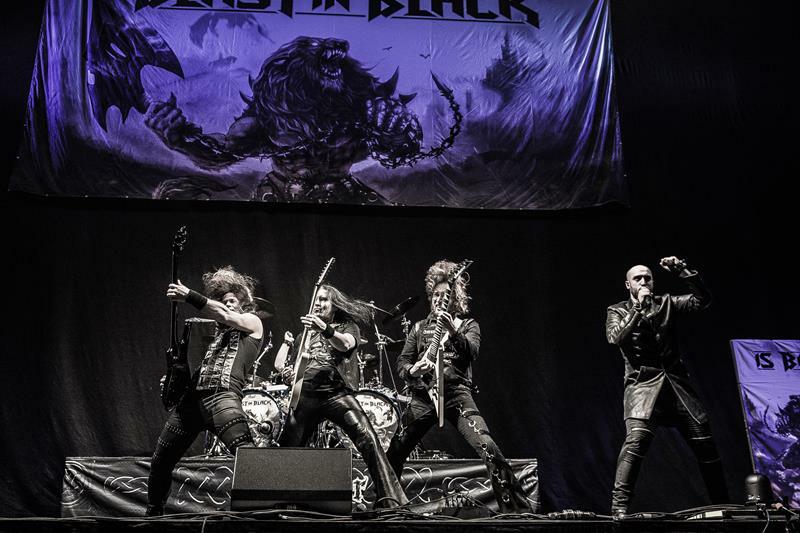 Check out https://www.facebook.com/beastinblackofficial or www.beastinblack.com for more information about the band. 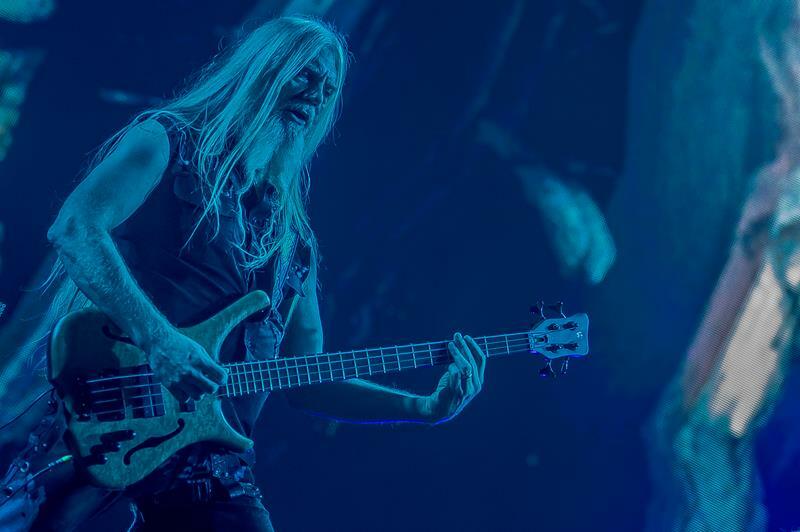 A sold-out König-Pilsener-Arena in Oberhausen plus the usual Friday afternoon traffic are not a good mixture to get somewhere in the Ruhr area. 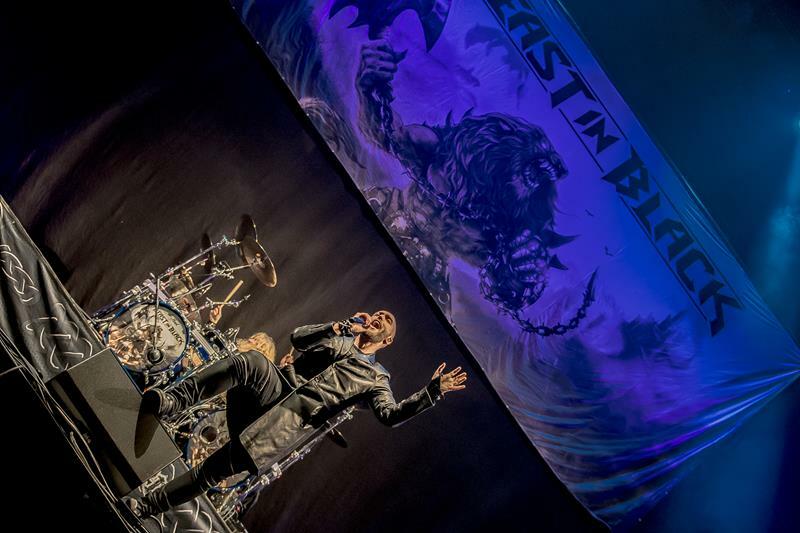 However, lots of fans seem to have gotten there early, as the security check went pretty smooth with short lines, and the arena was already quite full well before BEAST IN BLACK were supposed to start. 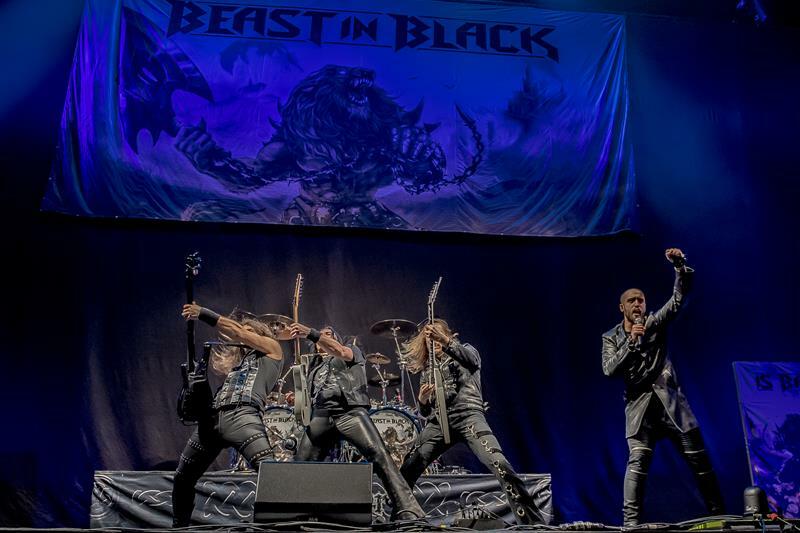 Shortly before 7pm, the JUDAS PRIEST song ‘Night Crawler’ let the people inside the auditorium know what time it was: BEAST IN BLACK went on stage and started their performance with the song ‘Beast in Black’. 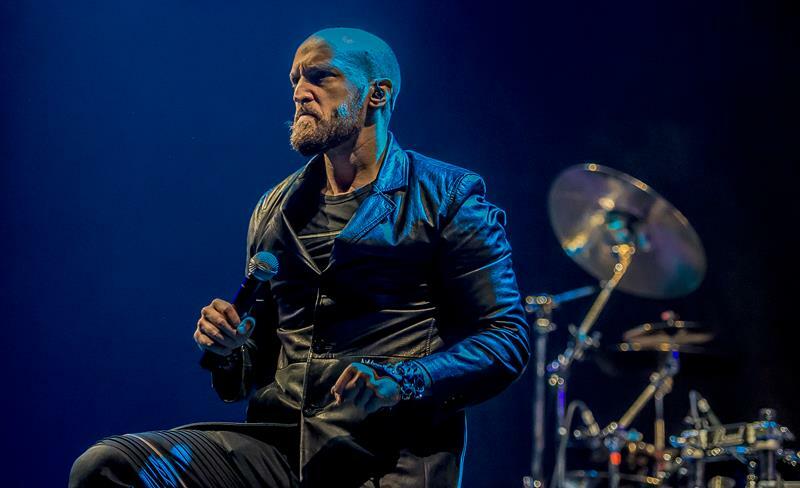 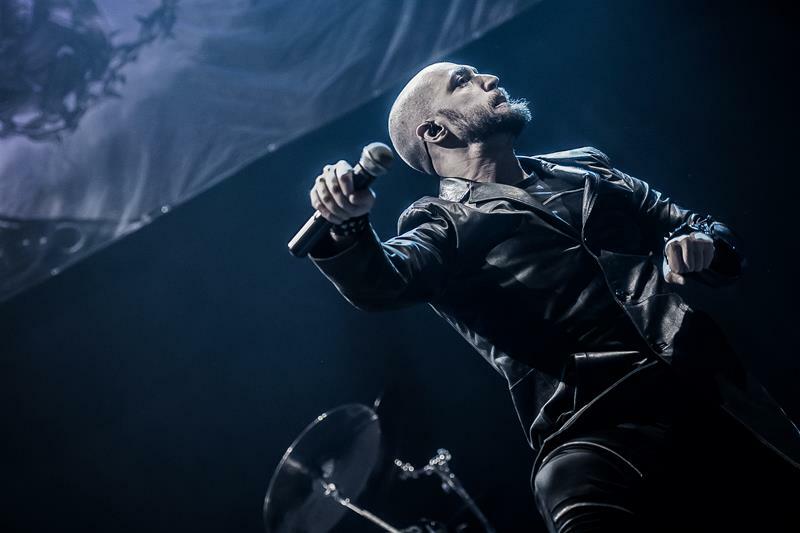 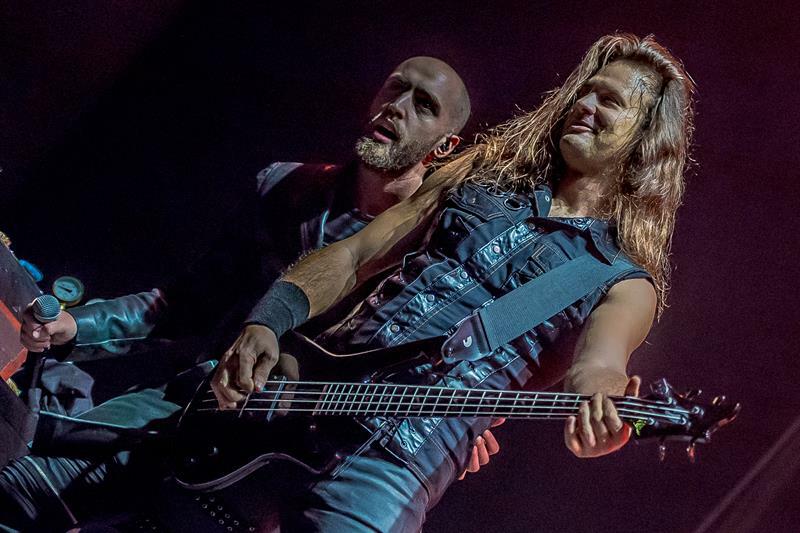 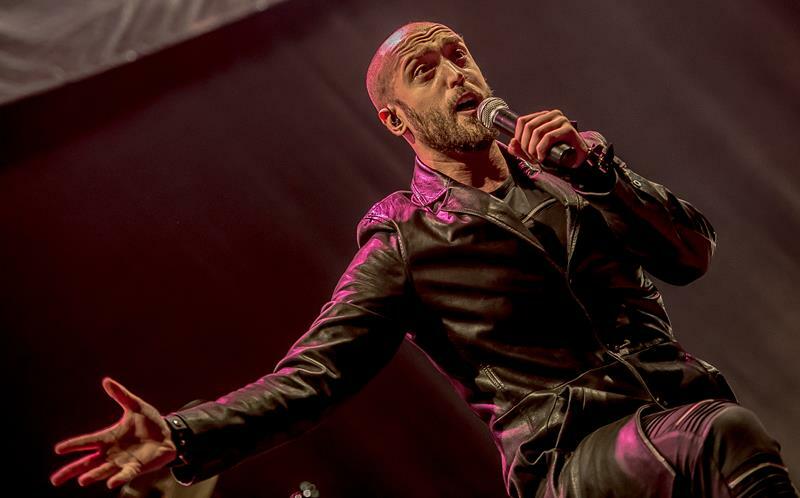 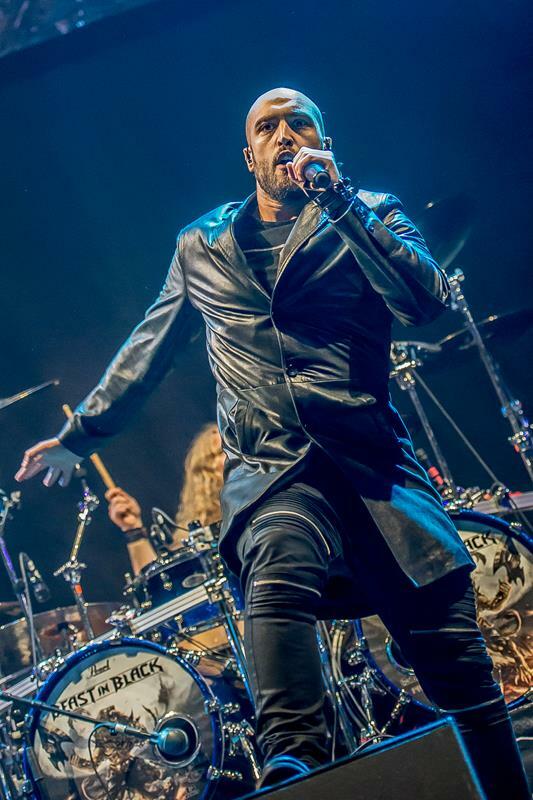 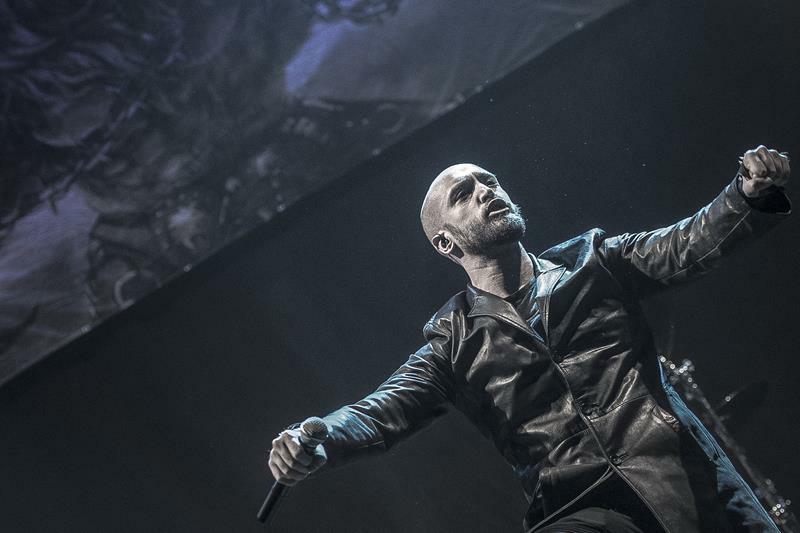 The five-piece band embraced all the usual additives of Classic Power Metal, and vocalist Yannis Papadopoulos with his bald head, long leather coat, and shrill voice made it very easy to guess one of the band’s major influences. 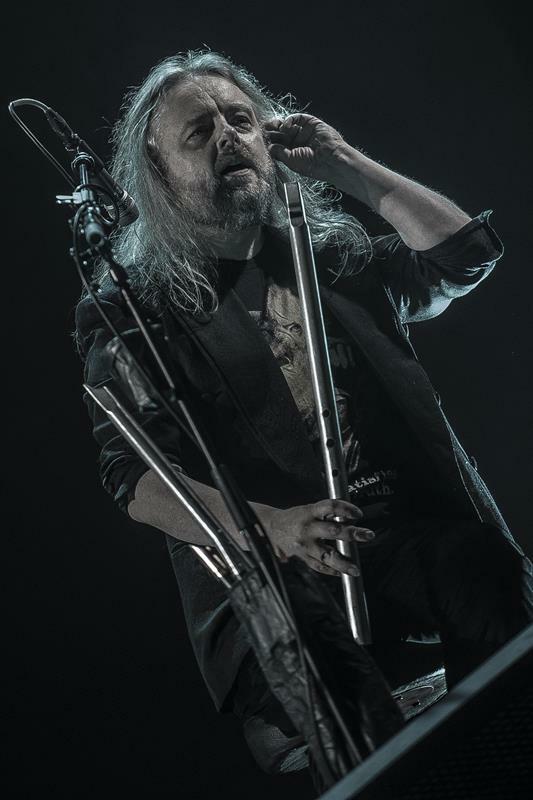 New drummer Atte Palokangas entertained the crowd with occasional sections during which he hit himself over the head with his drum stick while keeping the beat. 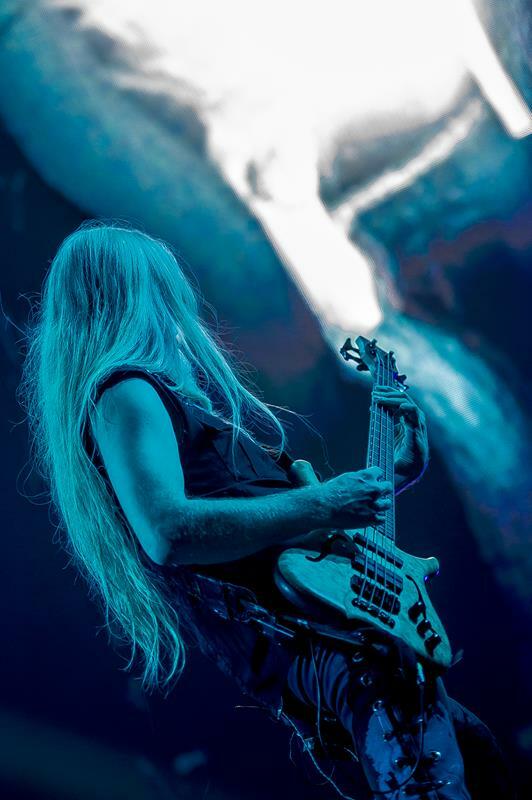 The instrumental fraction engaged in seemingly completely un-ironic synchronous moshing orgies, and during the ballad ‘Ghost in the Rain’, singer Yannis encouraged everyone to bring up their lighters or cell phones to light up the round of the arena for some truly inspiring moments. 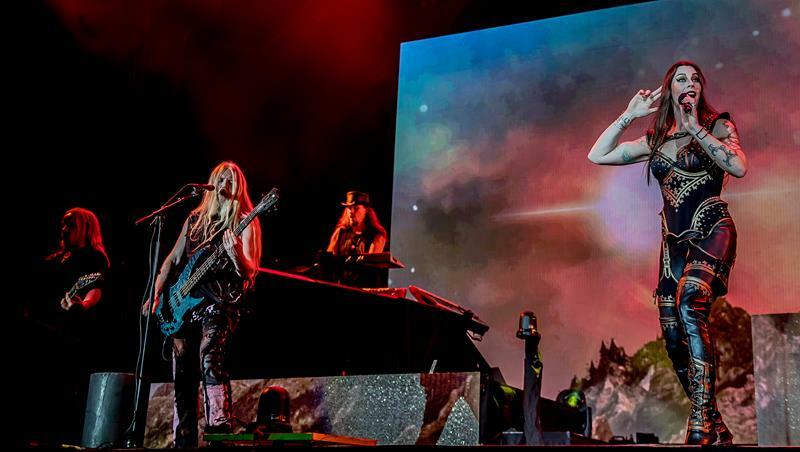 For ‘Crazy, Mad, Insane’ the band members wore sunglasses with electronic displays on them, all while acting very mechanical and robot-like. 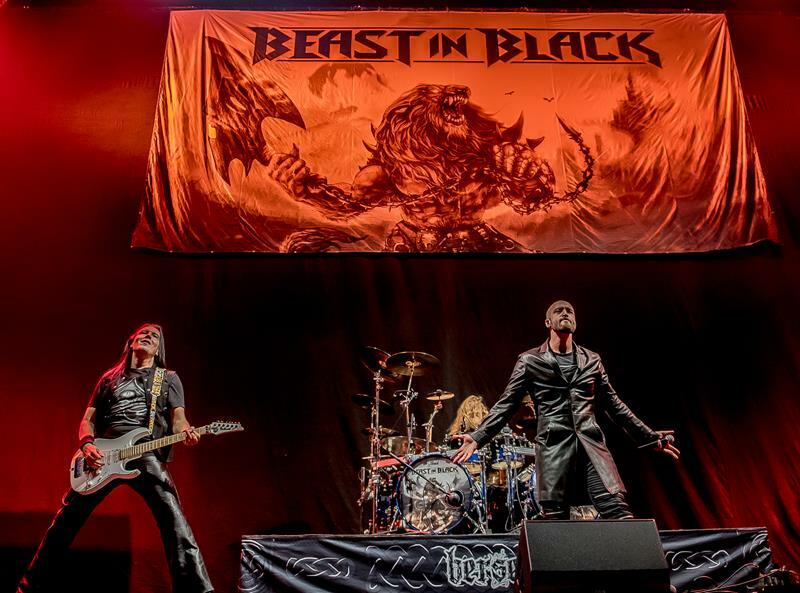 So, BEAST IN BLACK pulled all the stops entertainment-wise to warm up the crowd during their 45-minute set. 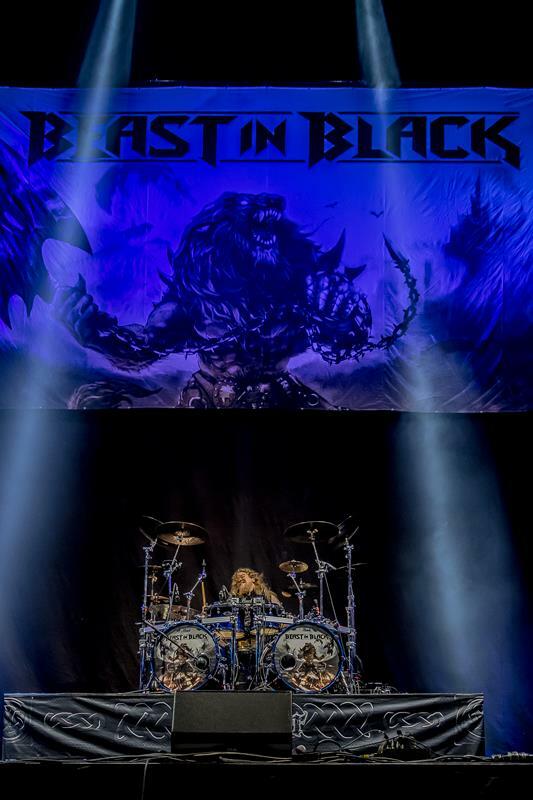 The changeover was relatively brief with the stage having been shielded from the peering views of the audience with a huge black curtain. 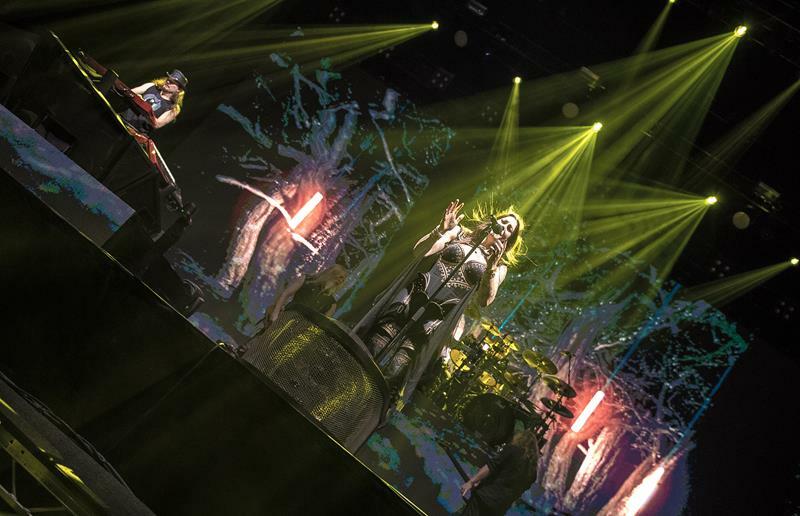 At 8:15pm, the lights went low, and the falling curtain revealed an impressive stage production with a number of giant high-resolution LCD screens. 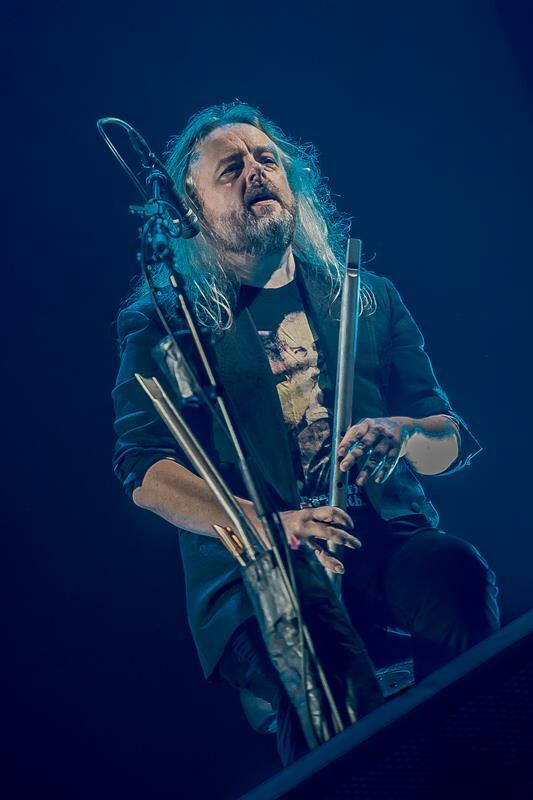 Ambient music started to play and a narrator’s voice with a remarkably British accent welcomed everyone to the show and reminded the viewers to experience the concert directly and put away their phones, as literally no-one would want to look at their rubbish, wobbly video footage on the internet later on. 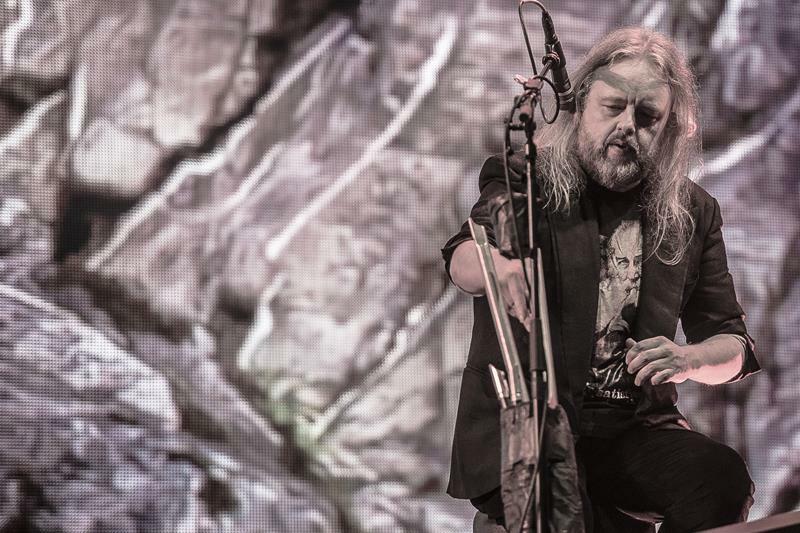 After that, a 60-second countdown appeared on the projection, marking the start of a soothing performance by Uilleann (it’s Irish, google it) pipe player, and latest addition the band’s line-up, Troy Donockley. 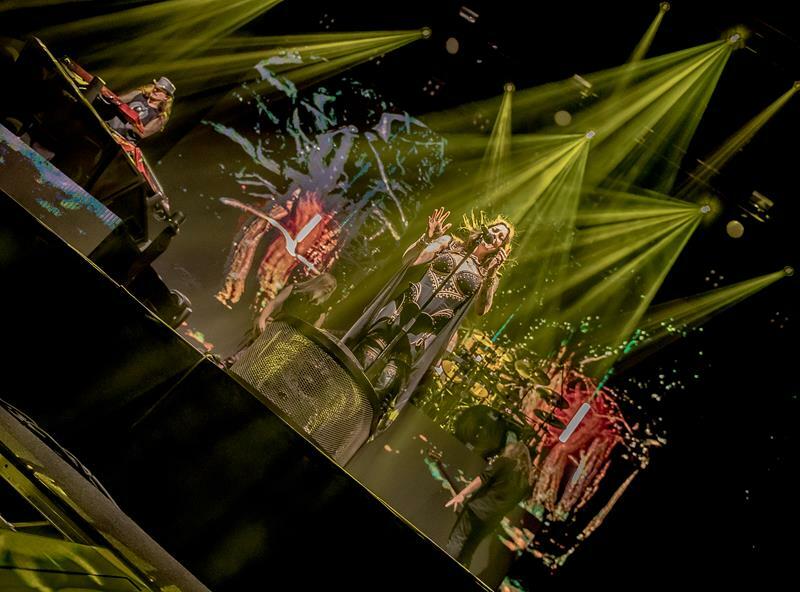 At the same time, the virtual gate of the projection opened up to give way to a “Game of Thrones” like clockwork, which made a fascinating watch. 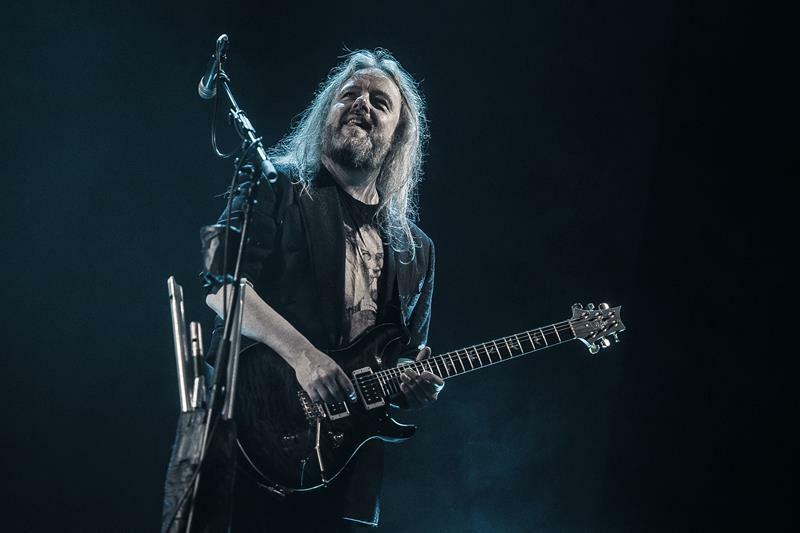 Troy’s pipework spilled over into the song ‘Dark Chest of Wonders’ from the 2004 album ‘Once’, which marked the breakthrough for the band. 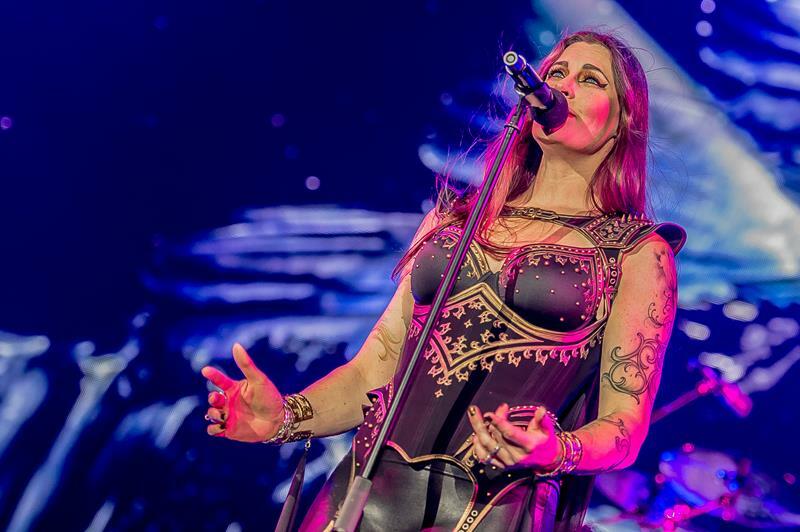 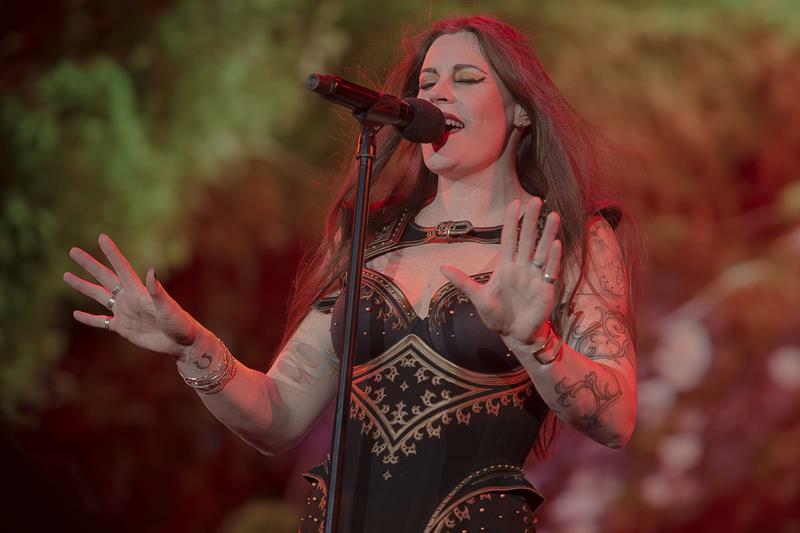 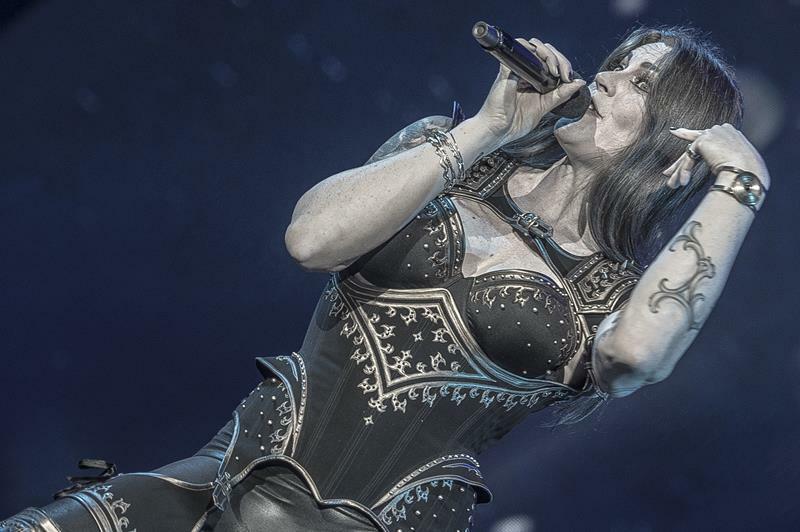 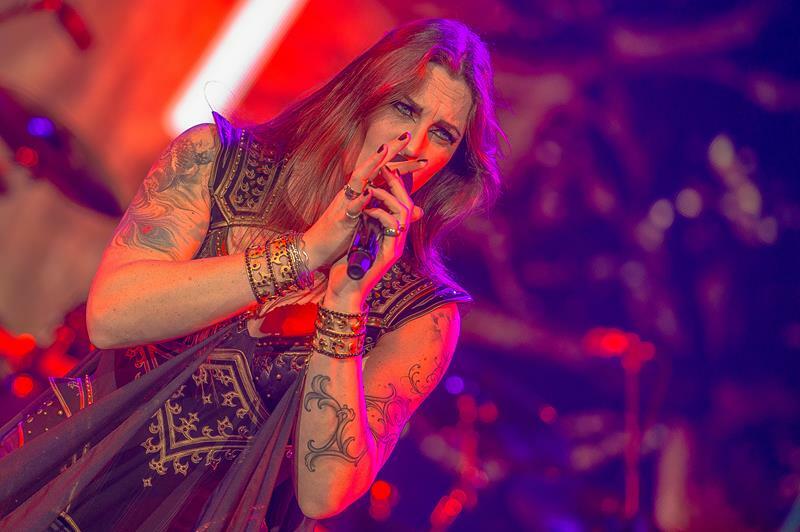 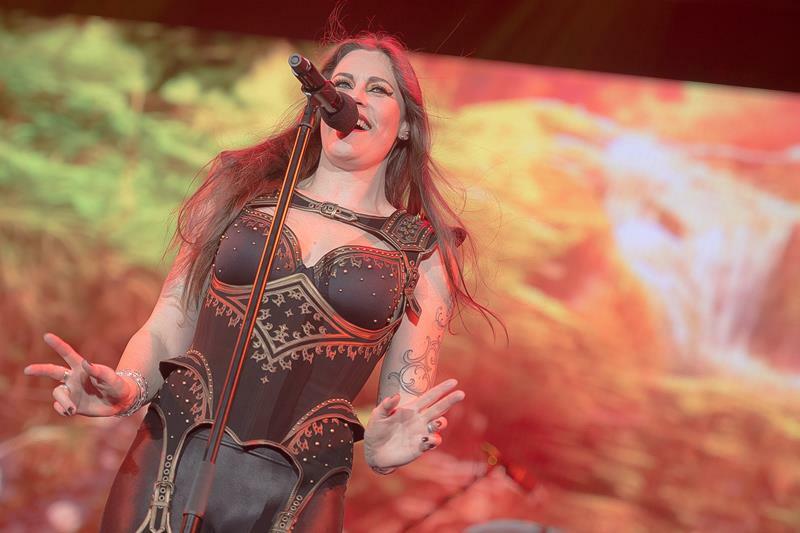 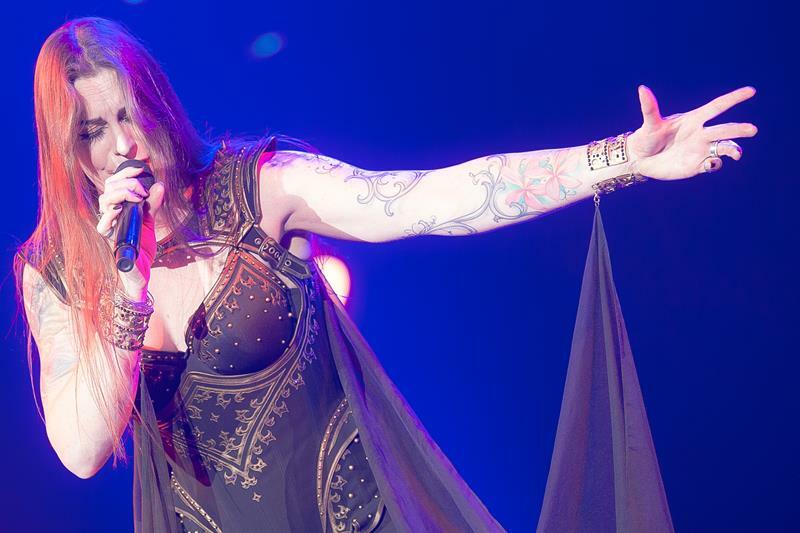 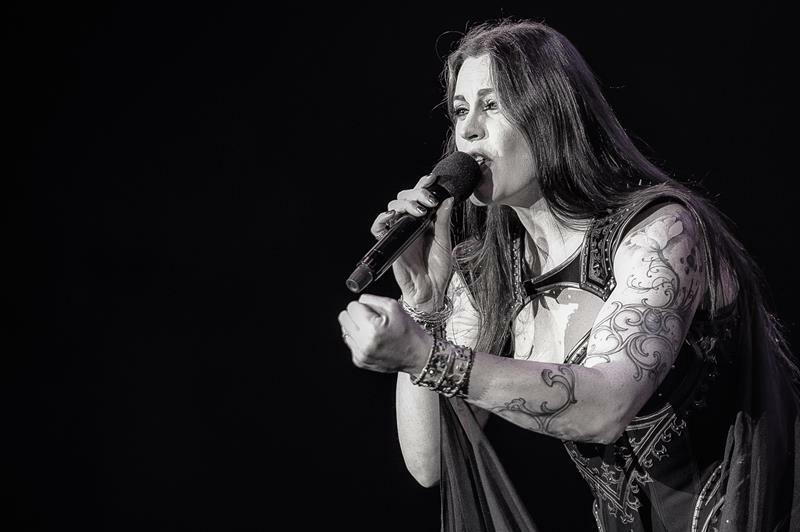 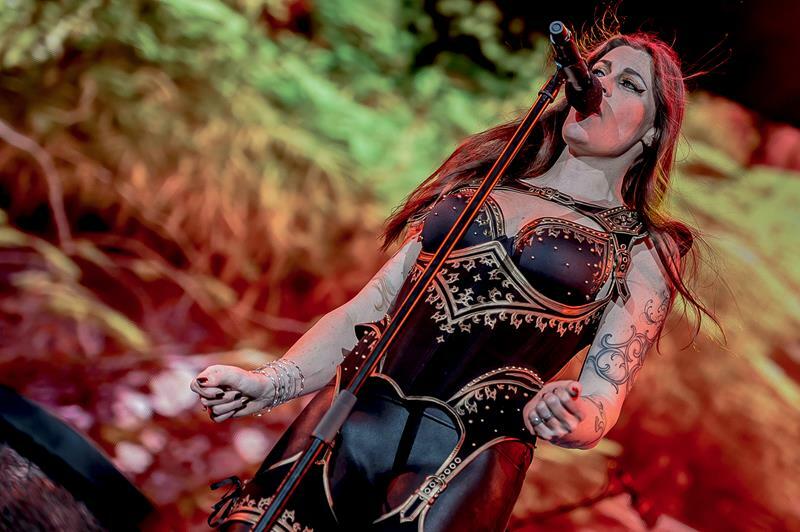 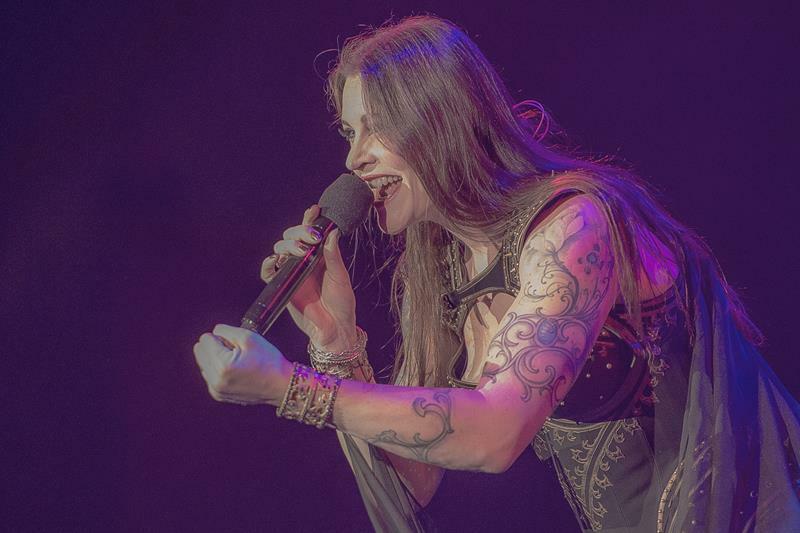 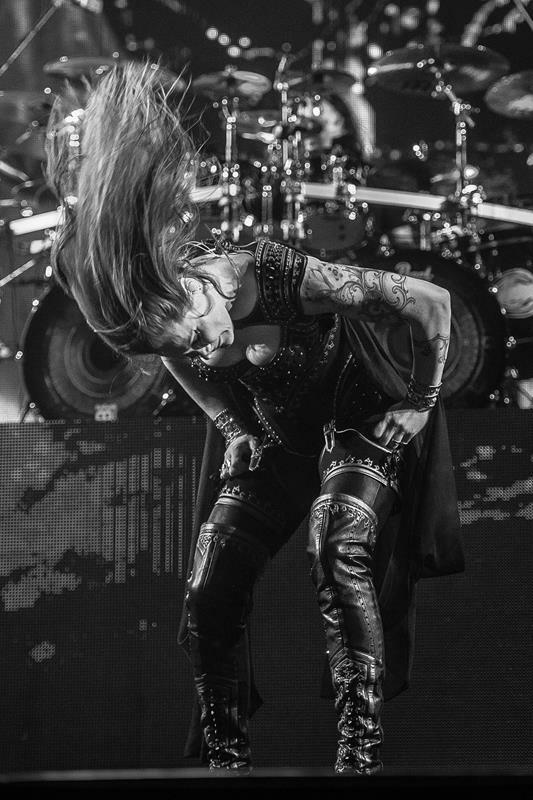 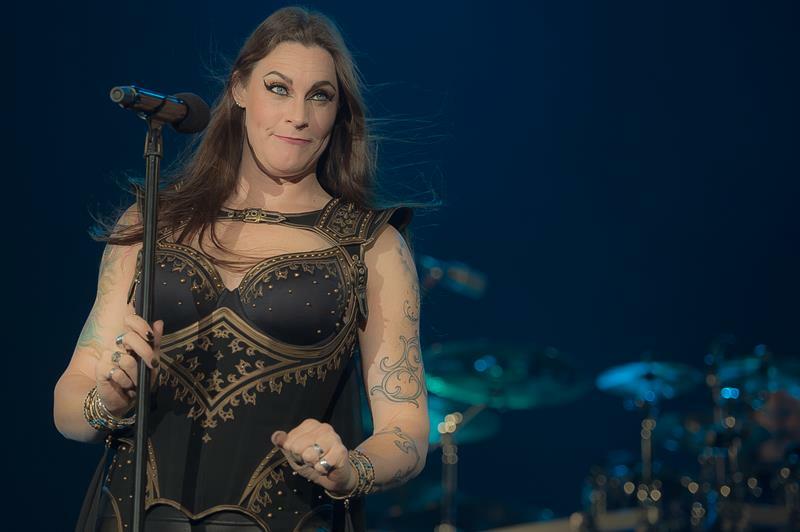 Last on stage was lead singer Floor Jansen, whose arrival at the band in 2013 as a replacement for then singer Anette Olzon once again caused bitter and messy divisions in the ranks of die-hard NIGHTWISH fans. 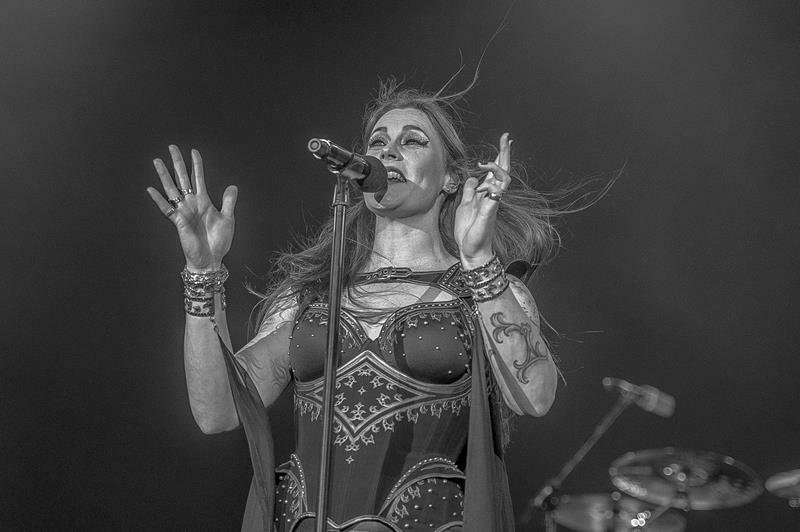 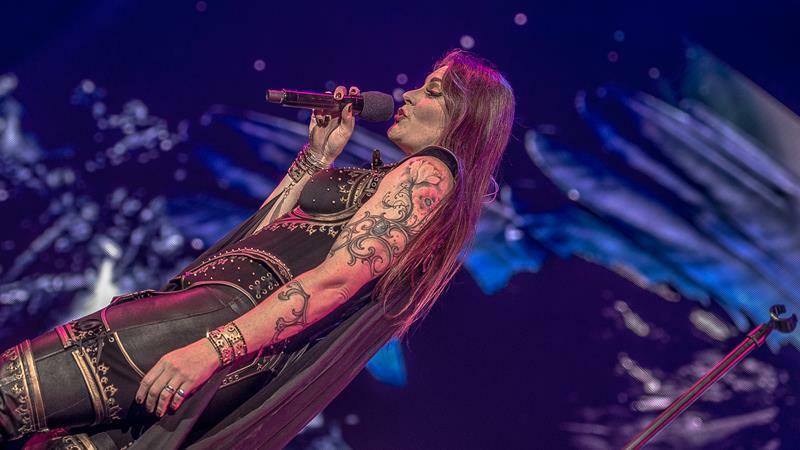 Dressed majestically like a true offspring of some “Lord of the Ring” film set, Floor commanded the fans with her breath-taking stage presence from the first second. 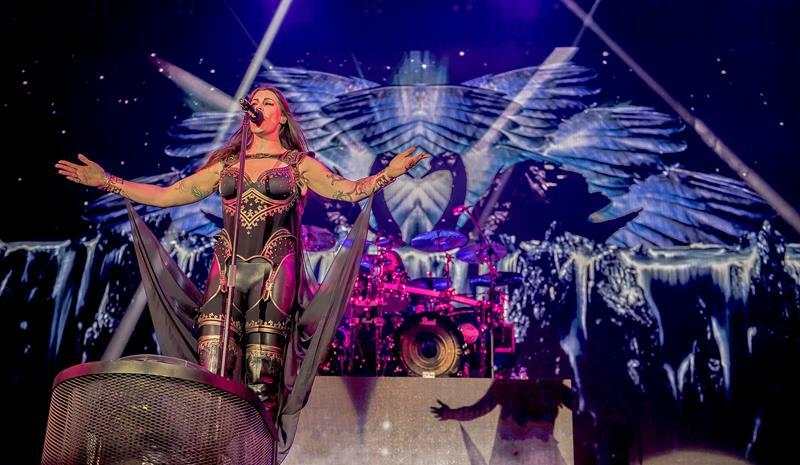 Her rendition of the band’s older works fascinated the fans, and the pyrotechnics and firework effects, enhanced by the flawless projection did the rest. 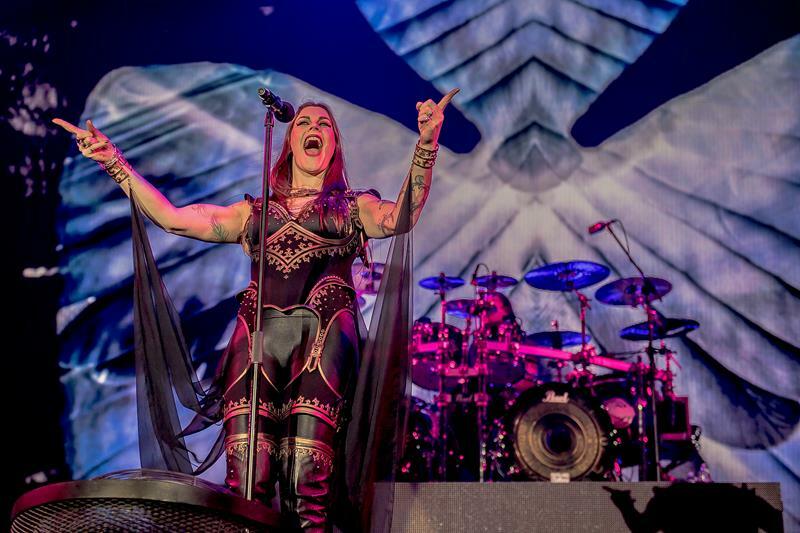 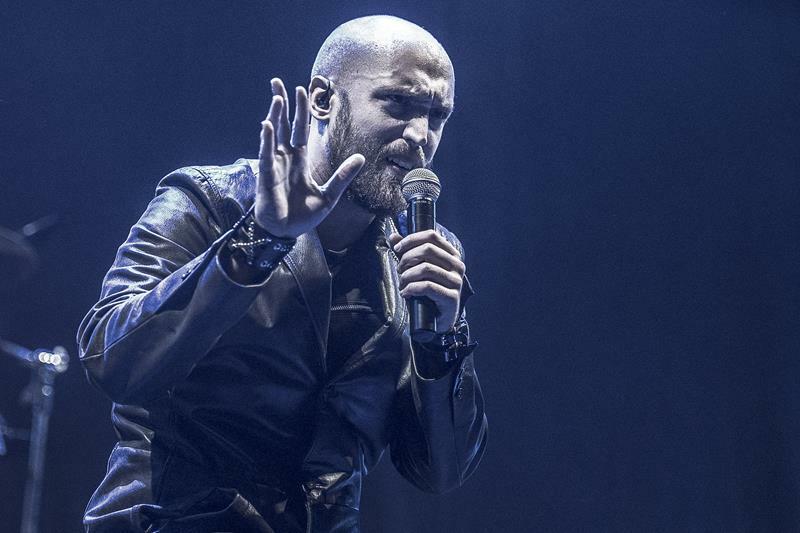 The approximately 12,000 fans inside the sold-out arena were seemingly very much infatuated with the band’s performance. 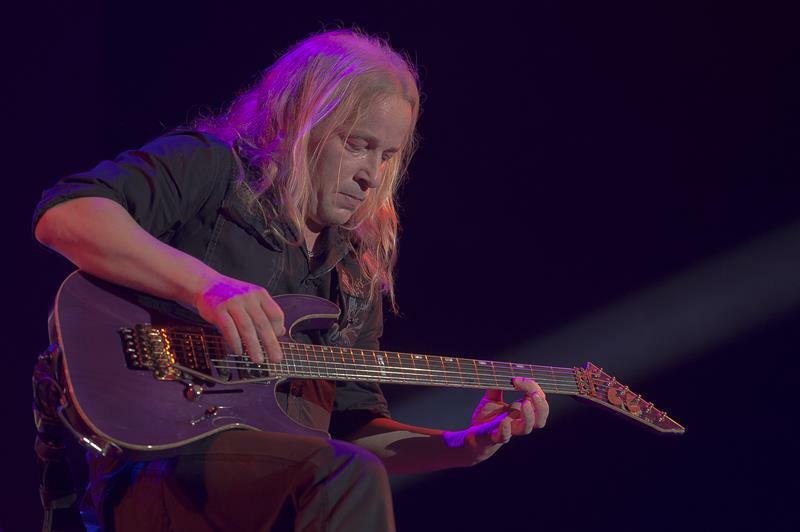 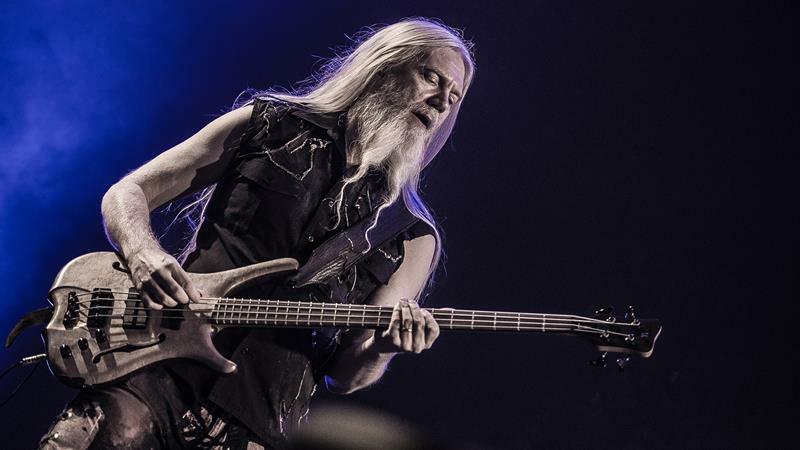 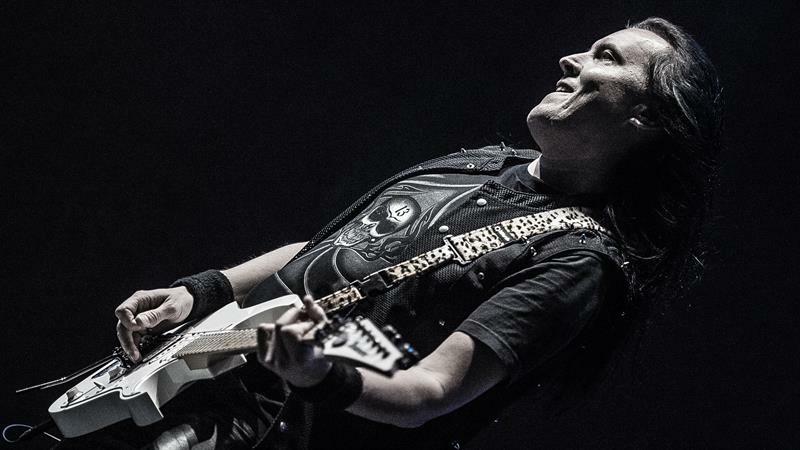 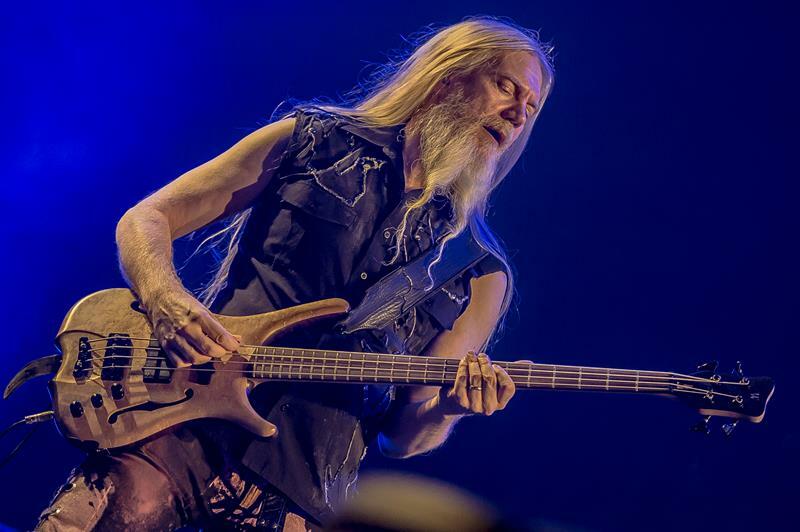 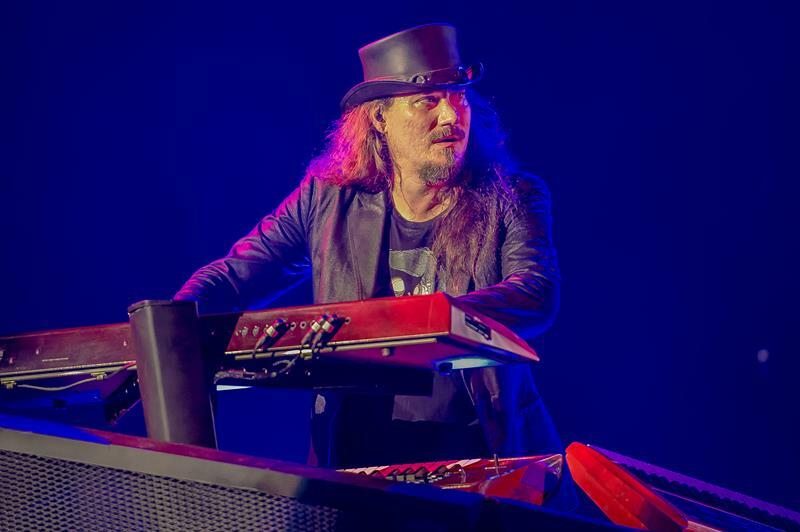 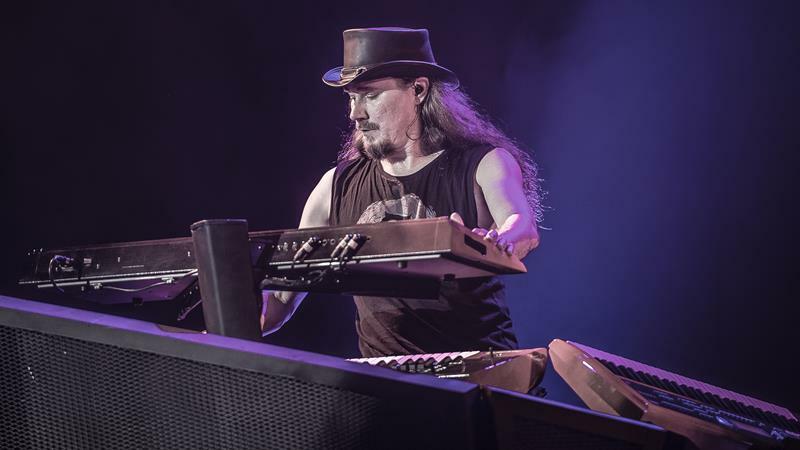 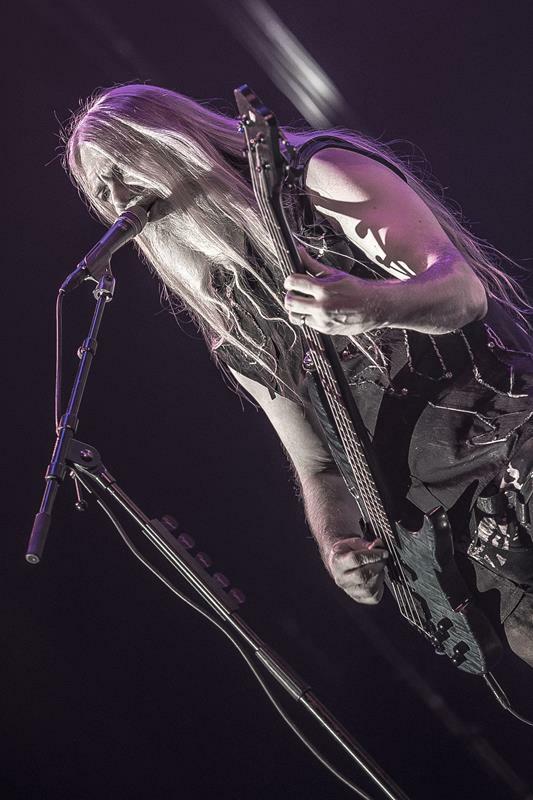 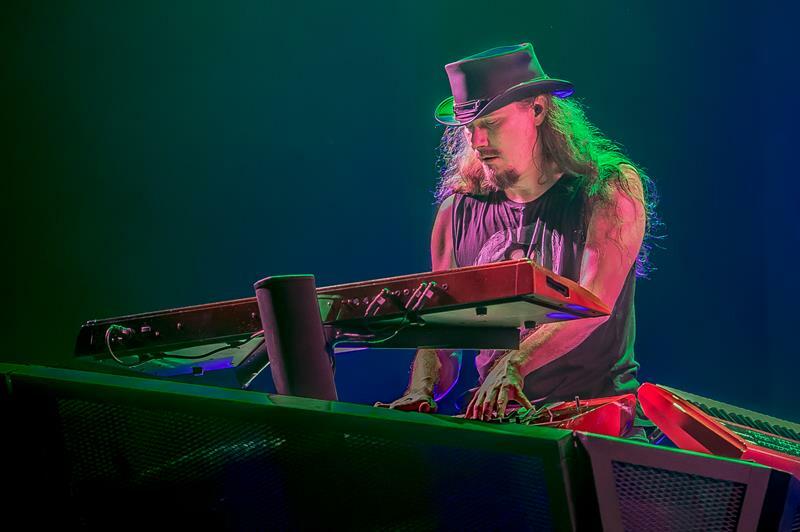 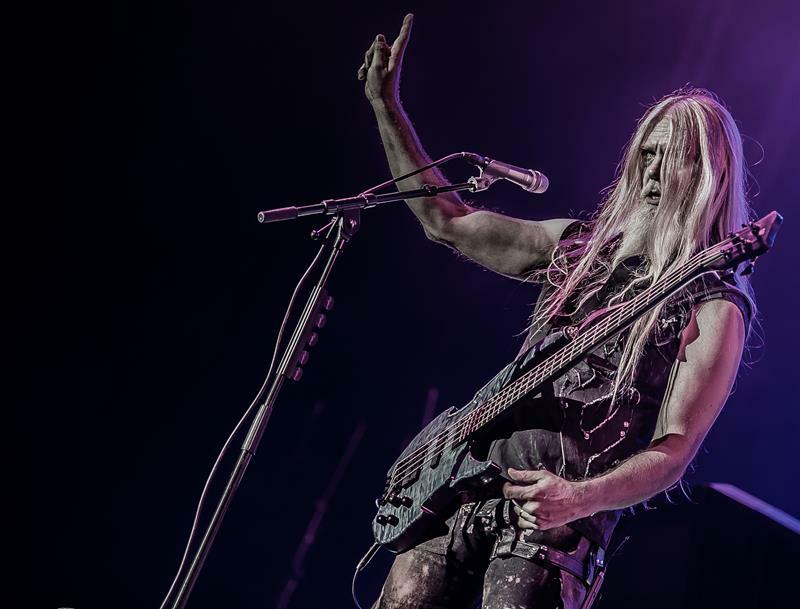 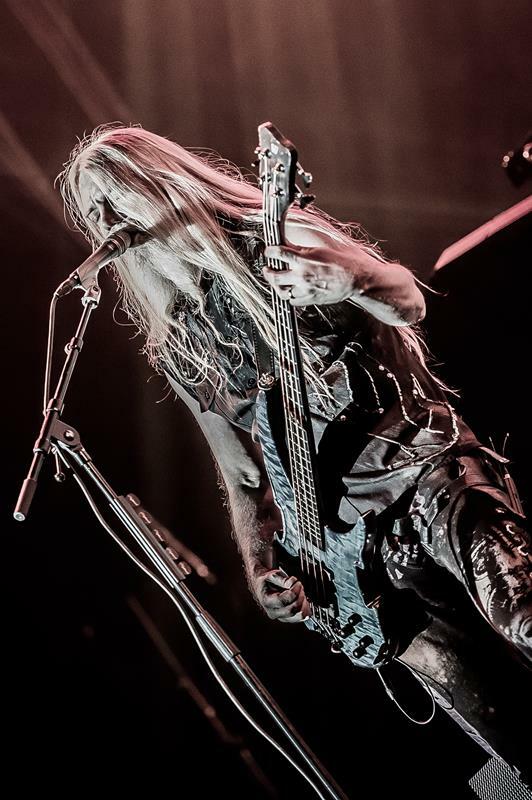 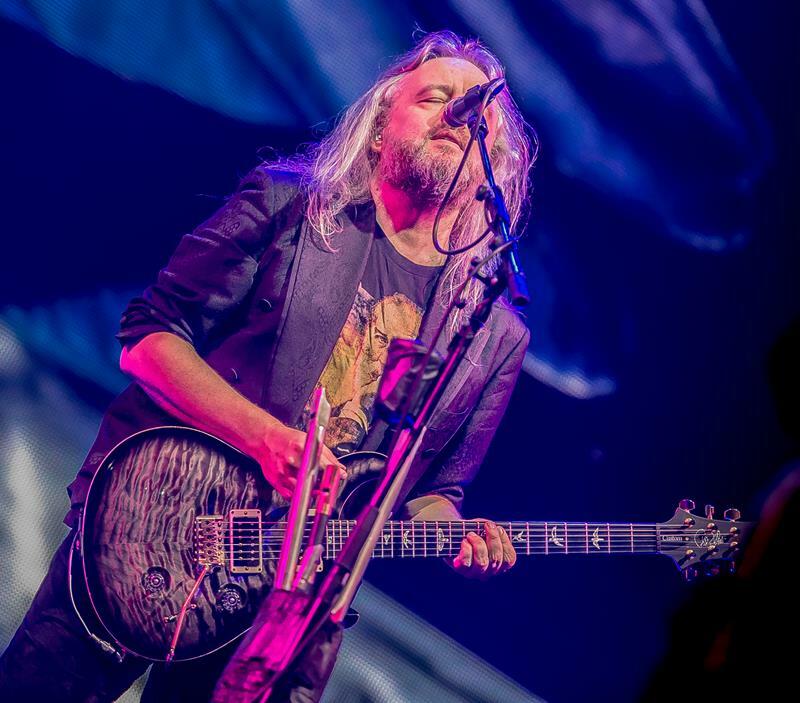 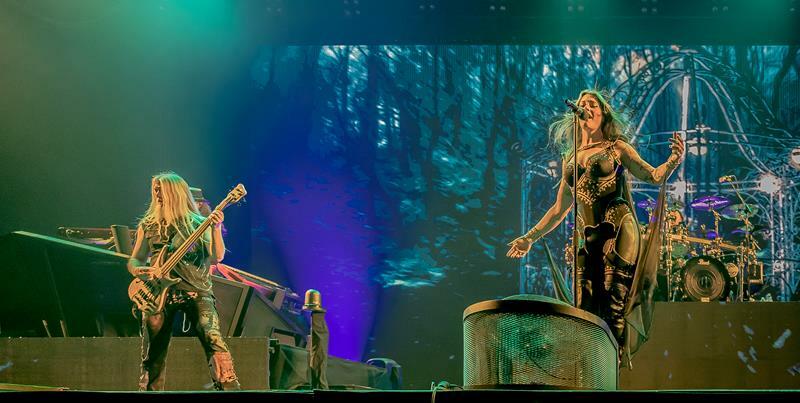 Over the entire playtime of 120 minutes, fans were meeting NIGHTWISH’s performance with euphoric cheers, even though the band’s song material proved to be the exact opposite of “radio-friendly” with its layered approach and song lengths well exceeding the 10-minute mark. 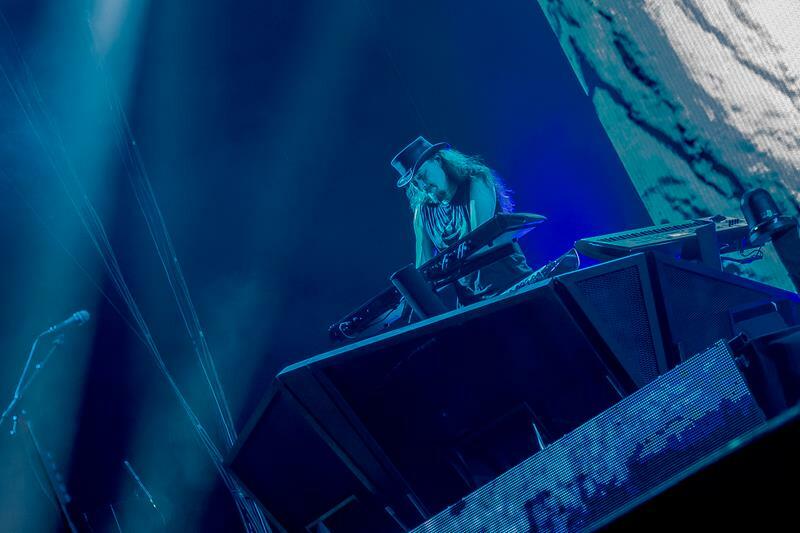 It all culminated in one big eruption, when during the last song ‘Ghost Love Score’, tons of red confetti strips exploded in front of the stage, bringing the epic show to a close at 10:15pm. 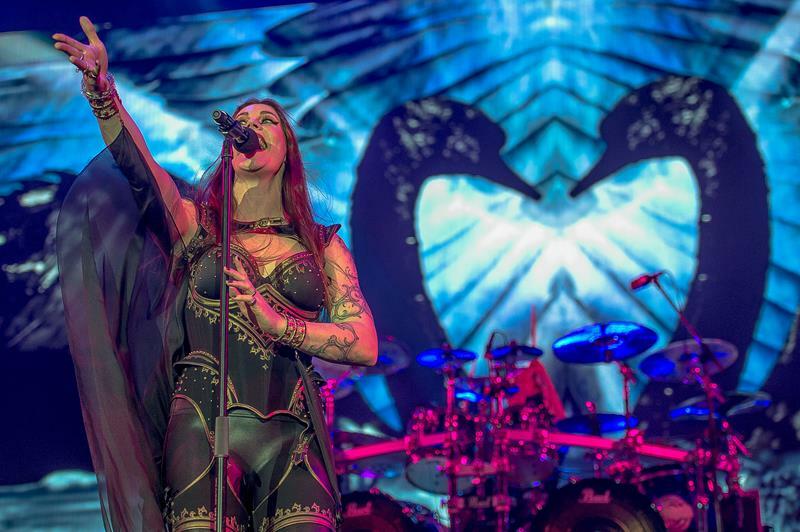 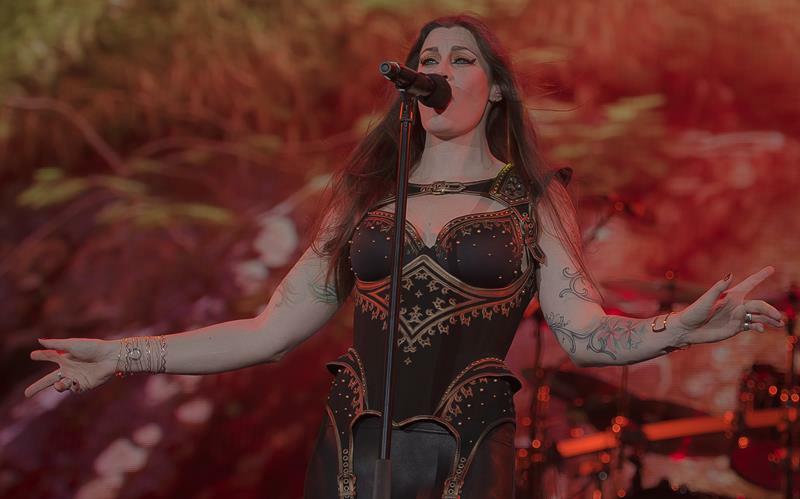 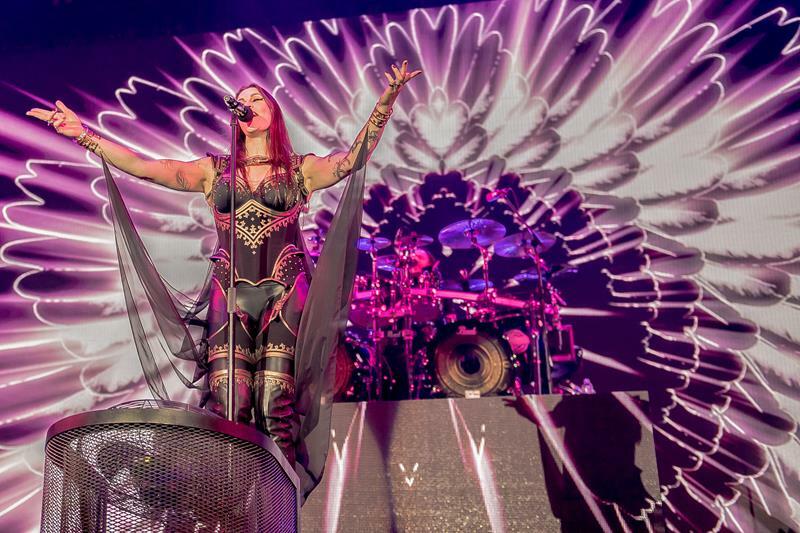 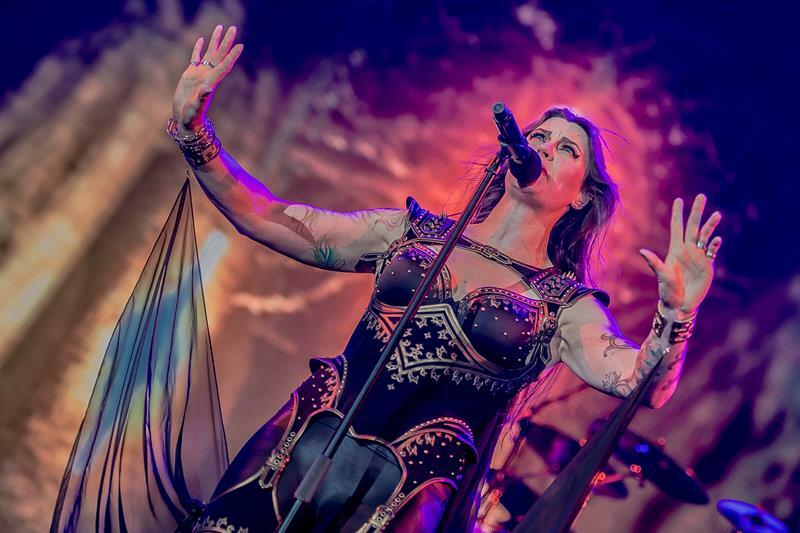 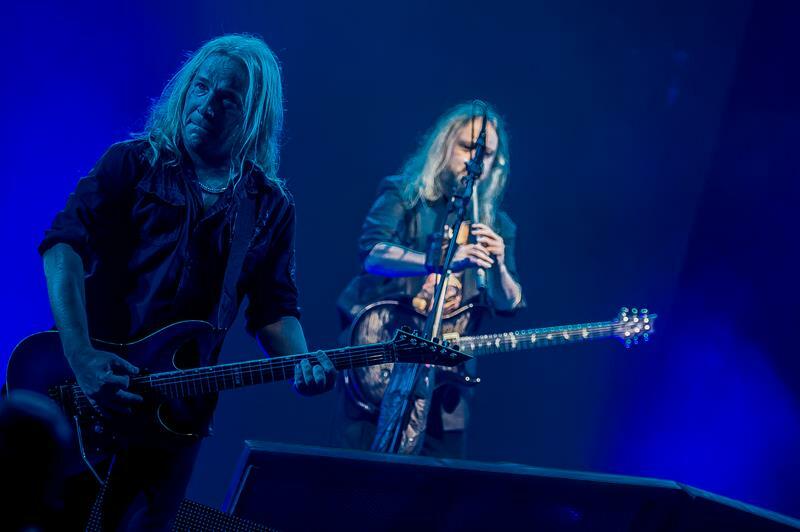 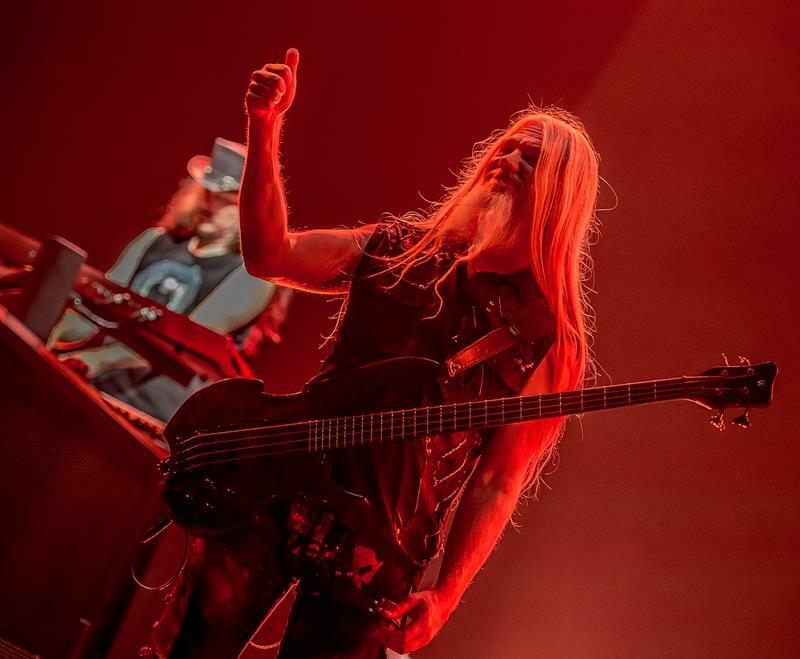 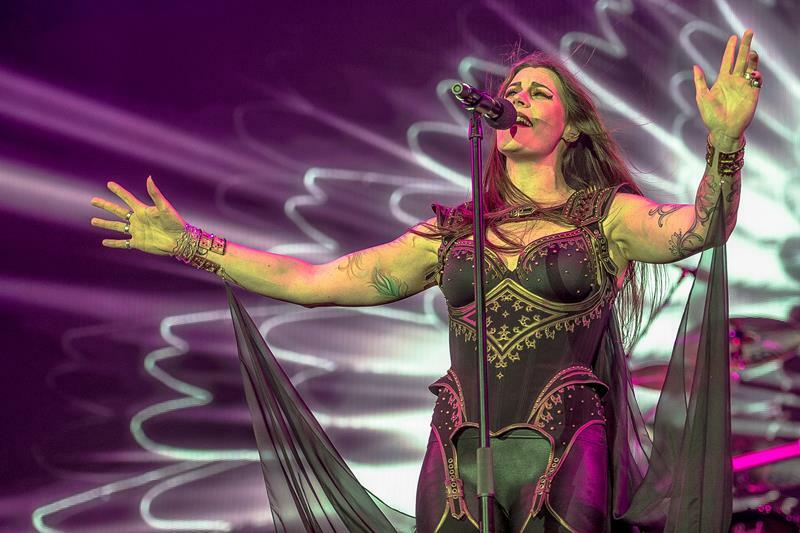 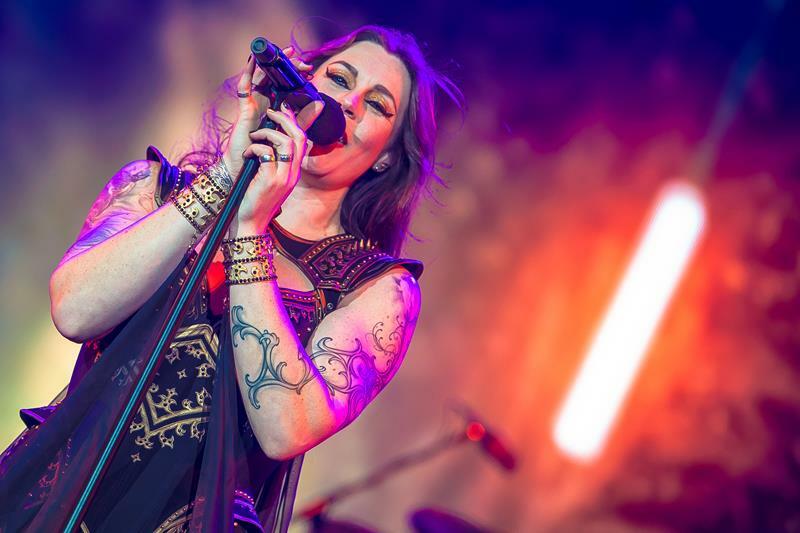 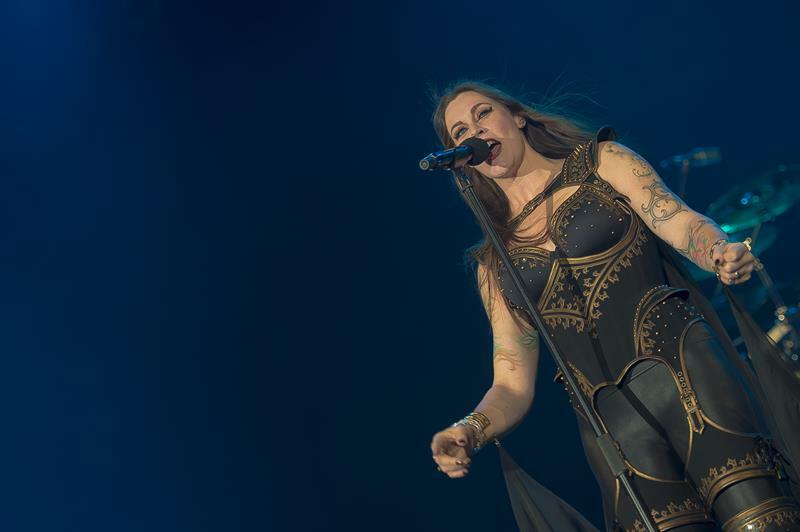 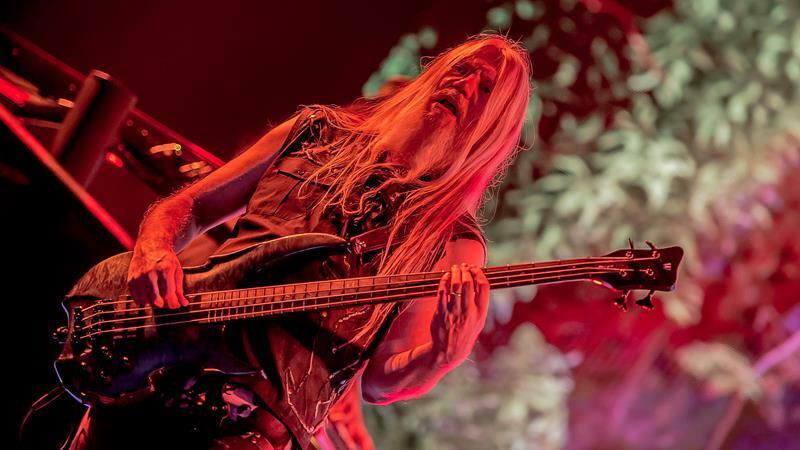 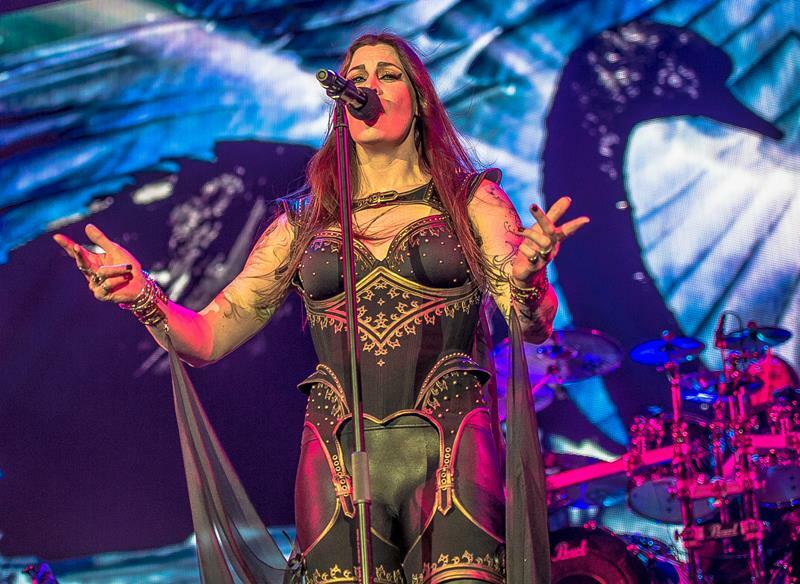 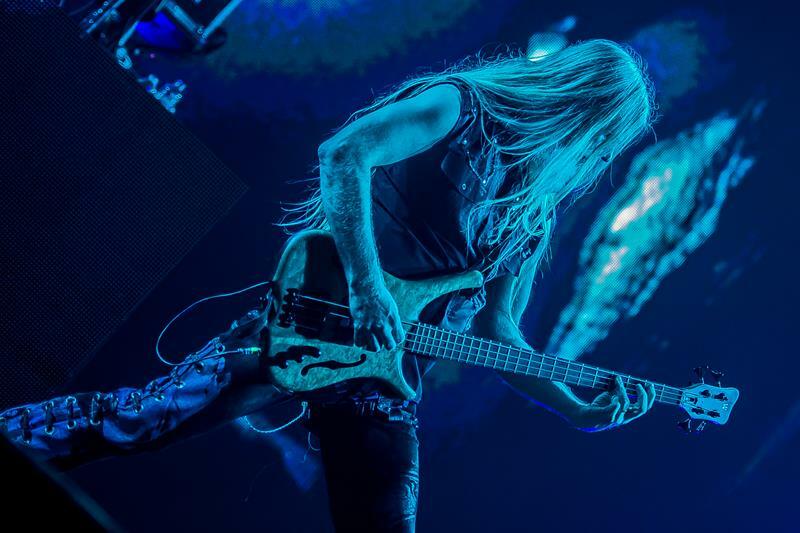 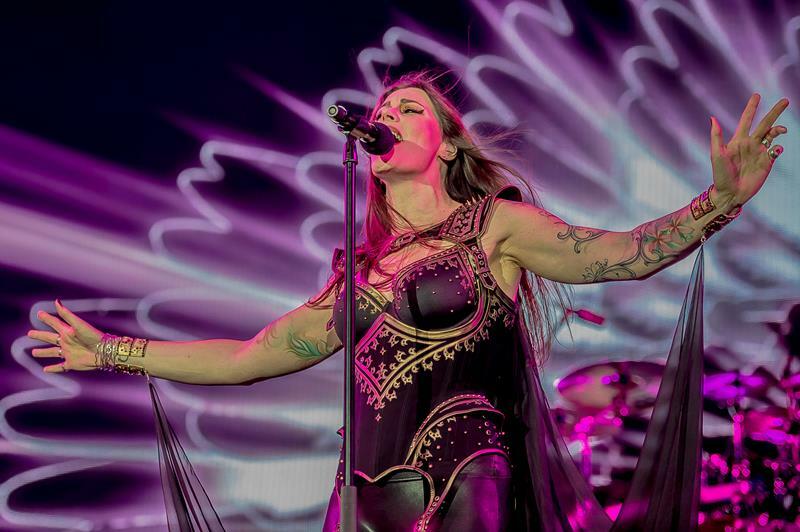 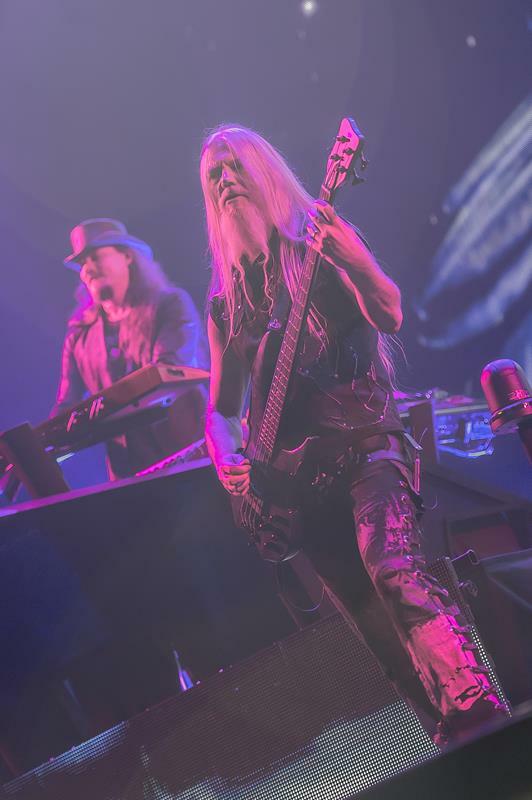 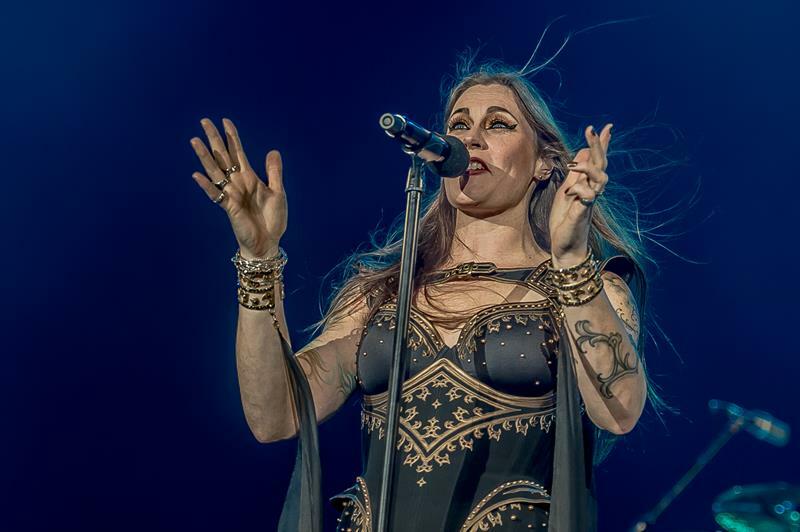 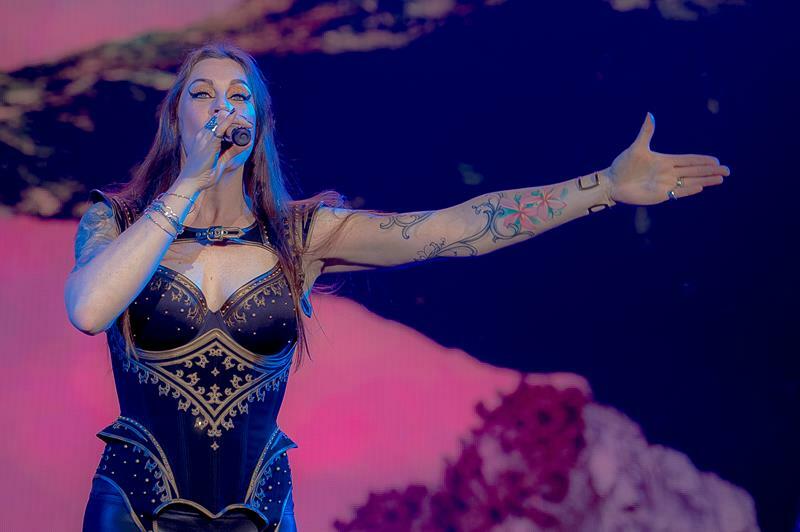 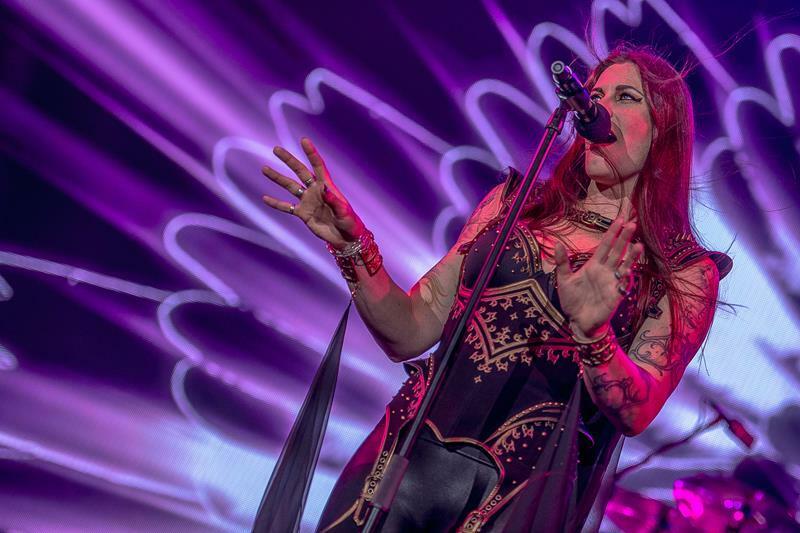 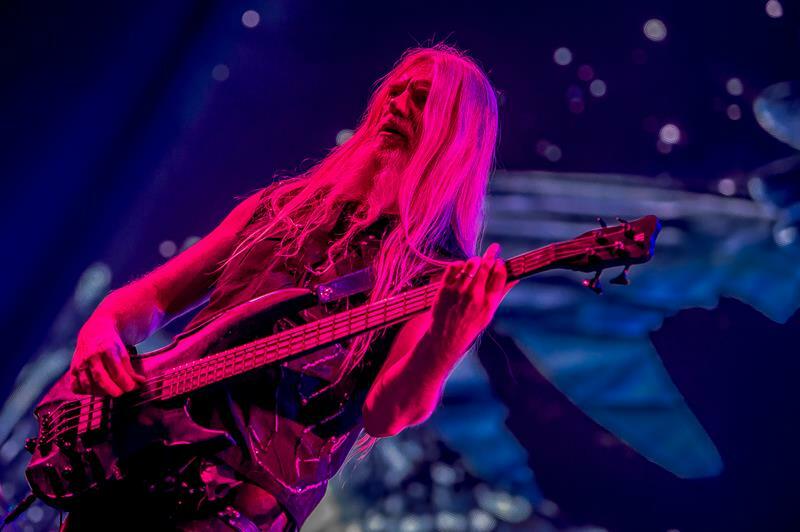 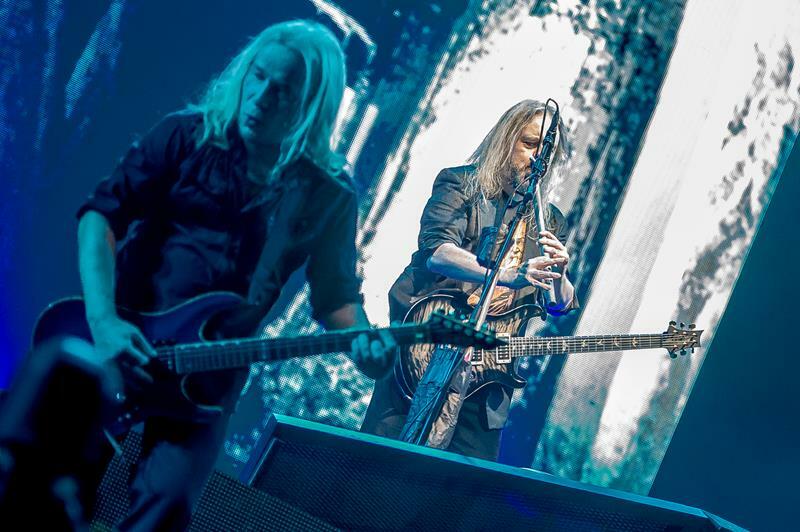 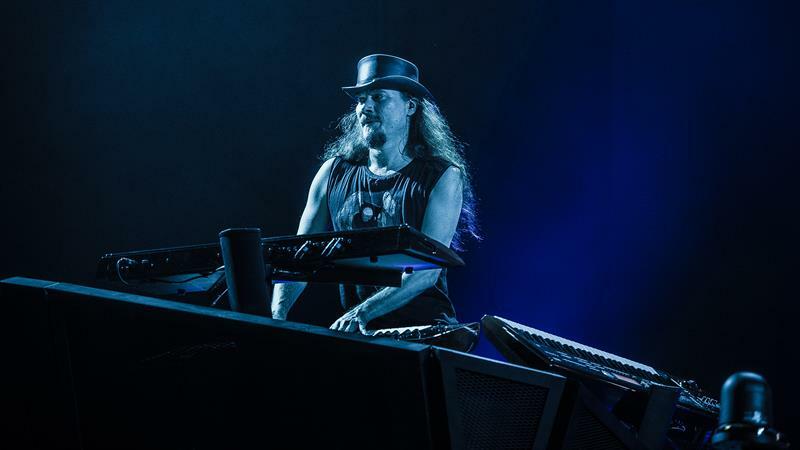 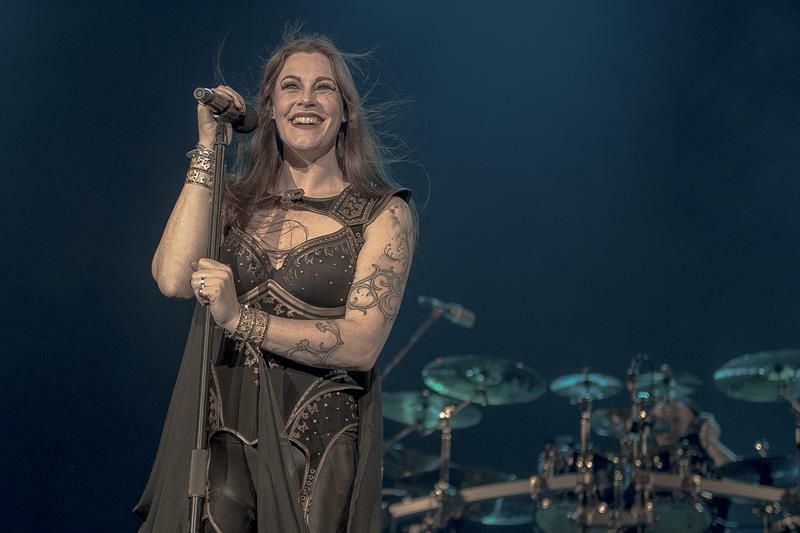 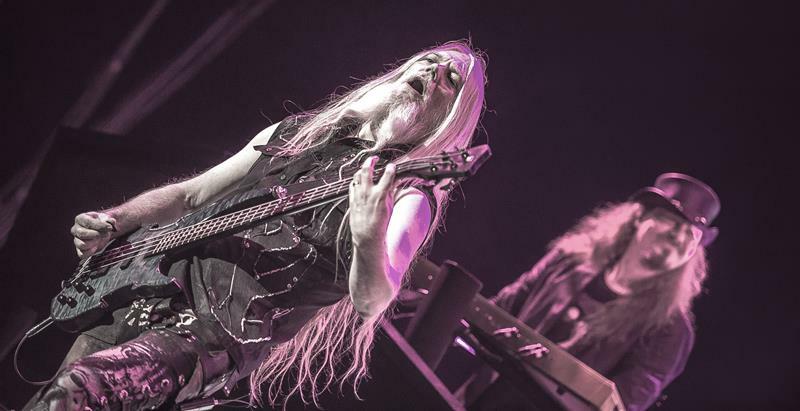 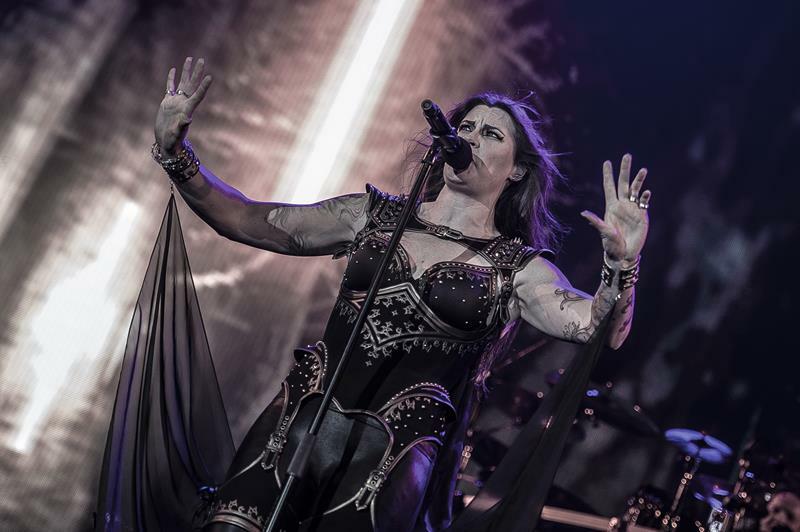 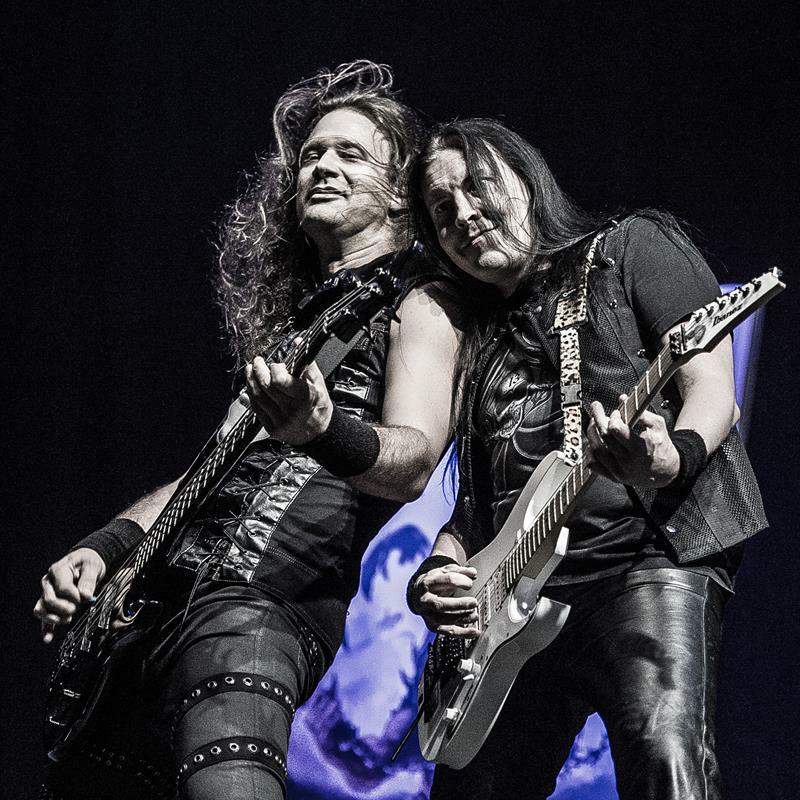 All in all, NIGHTWISH seem to be continuing their journey through the symphonic metal universe with their third lead singer quite successfully, as thousands of fans got what they wished for in terms of an evening worth remembering.